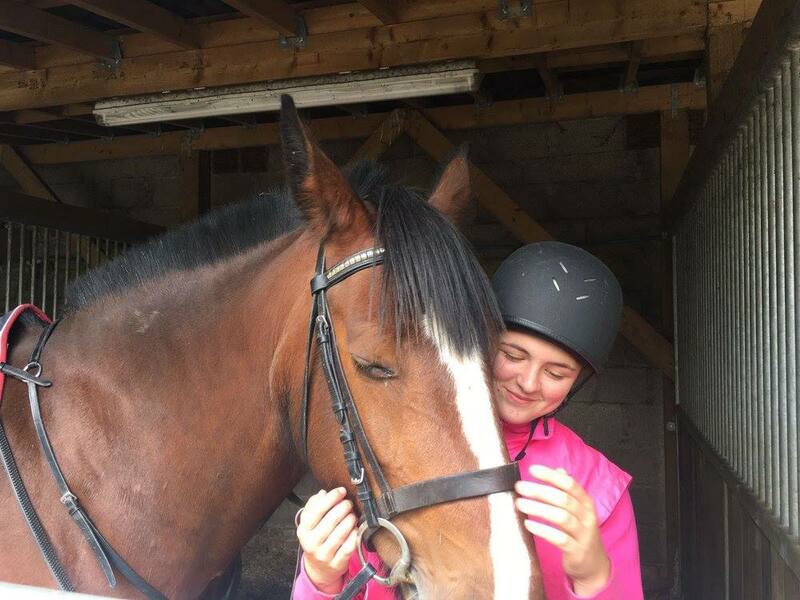 Thank you very much again for your kindness and for making him feeling home. Thank you for the splendid experience & all that he has learnt! Thank you for the wonderful family you have chosen for him! 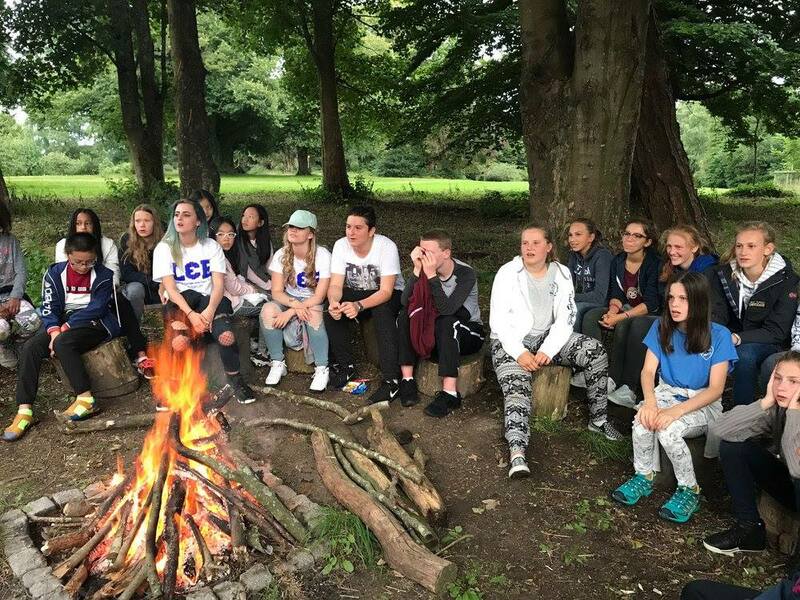 Sunshine, The New Forest and a great group of campers are the best ingredients for an amazing first night at the new L&E South Camp! The children arrived, excited for a new venue, and a new group of friends to be made. They ate a glorious BBQ on the terrace followed by lots of games with the tutors. 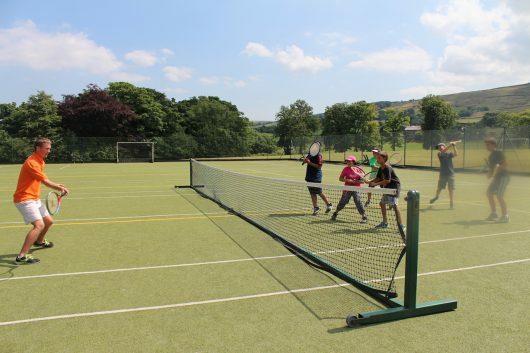 The campers were undefeated in a game named ‘splat’, much to the tutors frustrations. 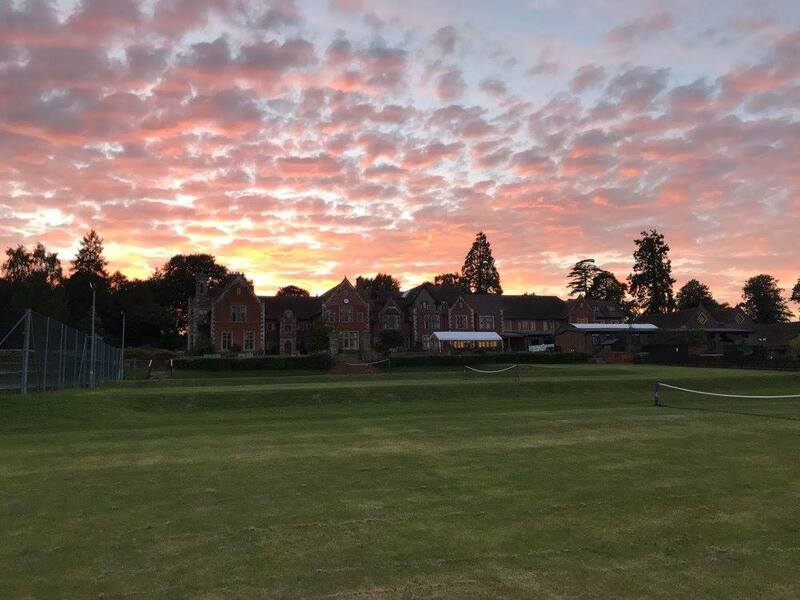 As the sun set over the old manor house, we all retired to some chocolate cake for Daniel’s birthday and then into our dorms for a good night’s sleep, all excited for what tomorrow will bring! Well what a way to start the first south camp! 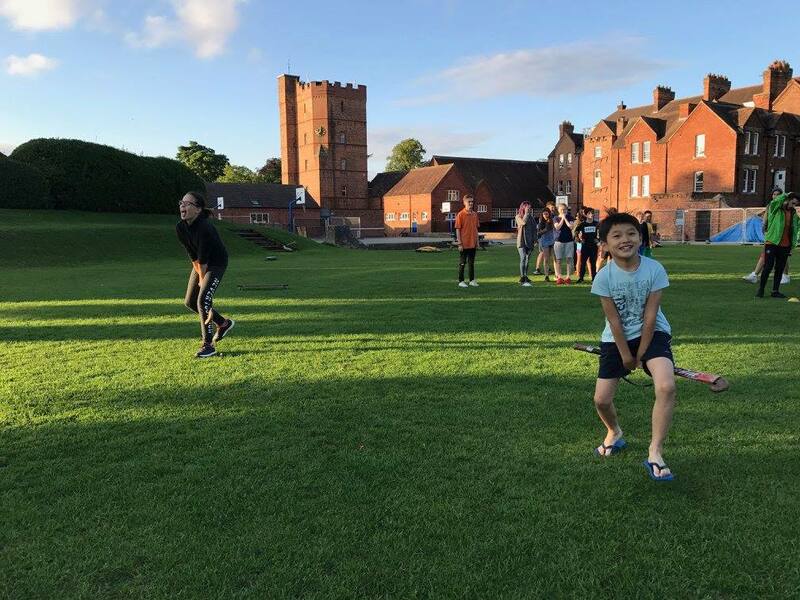 The children all arrived last night and we enjoyed games and a yummy BBQ together to get to know each other. 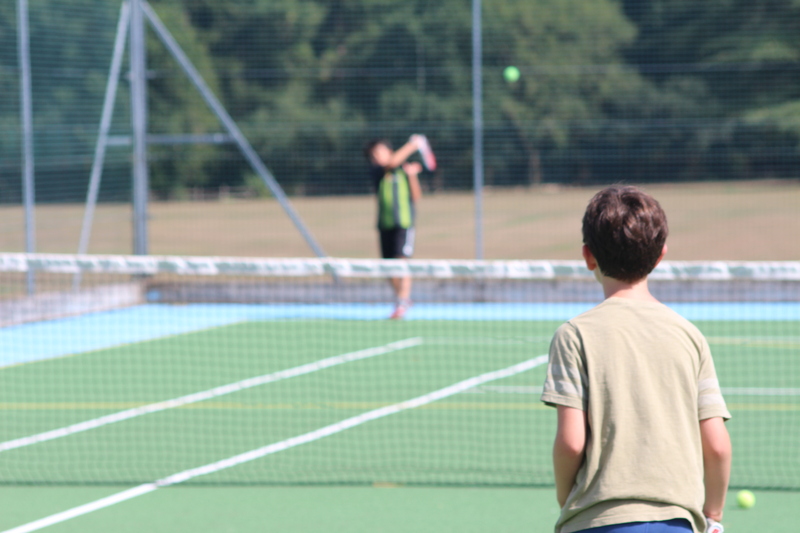 We hit the ground running today with a great session of Dodgeball, the children vs tutor games got very competitive! 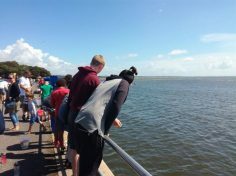 We then got straight into activities with one group heading out into the school grounds for some outdoor art, another group into the pool for water polo and the third group hopped into the bus and went down to Mudeford Quay to do some crabbing! 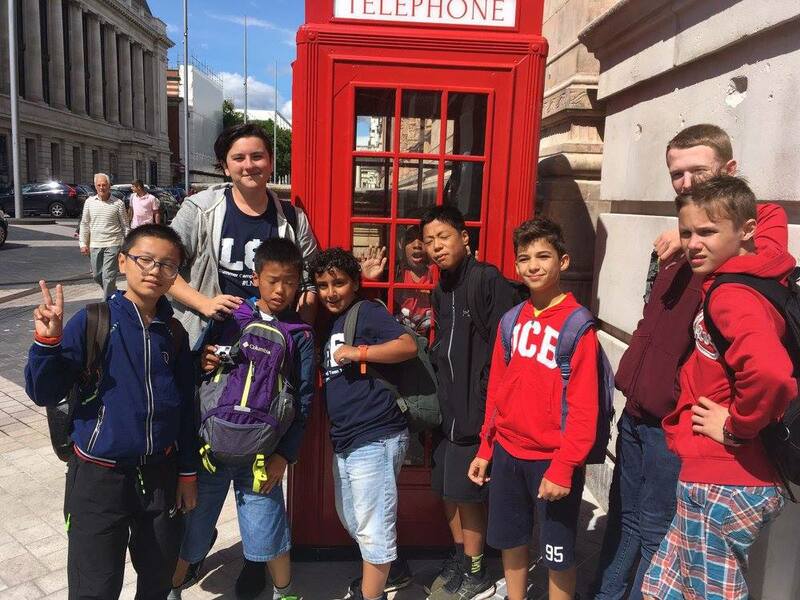 The fantastic English teachers took their groups for their lessons. The outdoor art group used natural resources to create pictures, they have turned out really well! 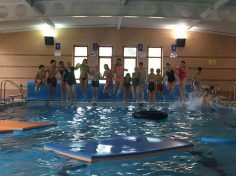 The sporting group had great fun in the pool playing water polo, before heading out to play football after biscuit break. The crabbing group, adventured to Mudeford and had a whale of a time catching a total of 13 crabs! After a great Lasagne lunch and a little bit of free time, the afternoon activities got underway. 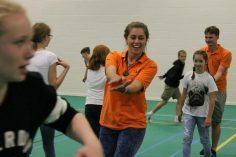 The activities included; creating stop-motion videos, den building, yoga, tennis, rounders, kick ball and wood weaving. 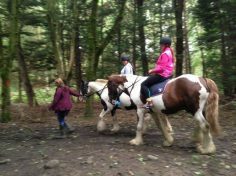 The children really enjoyed these activities and were all socialising well. 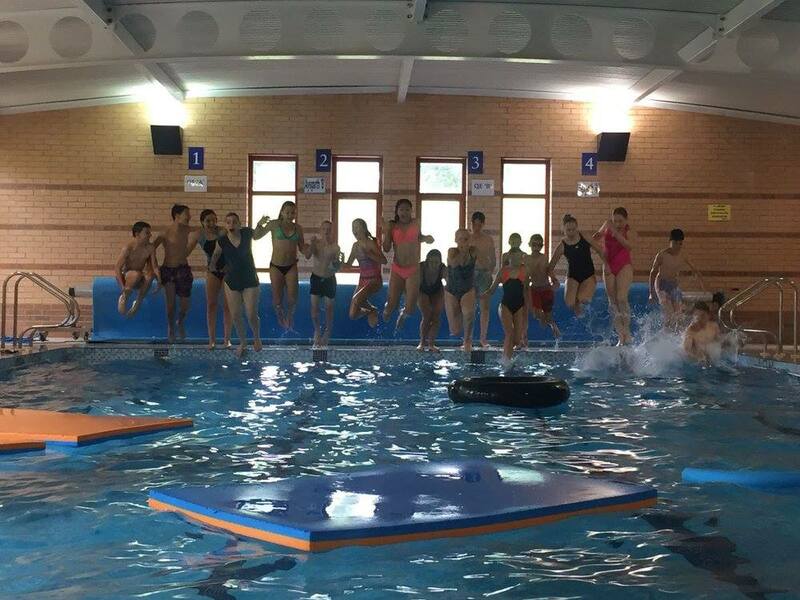 After the activities were finished the pool opened and lots of us enjoyed a cool off! 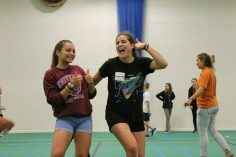 We then enjoyed dinner together and the evening was filled with fantastic ice breaker games from communication games to making up dance routines. The children have bonded well and the camp could not have started on a better note! Today’s blog post comes to you in campfire song! They hurl the ball faster than a car from a ramp. Making great friends, you and me. It’s better than North Camp! There were towers to climb. Will you come to me as my guiding light? Will you wash my heart? 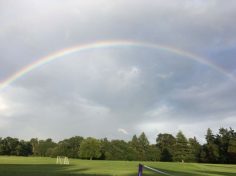 As Anup B Deen wrote in the poem, the rain can sometimes be a blessing and it certainly didn’t dampen our spirits today! 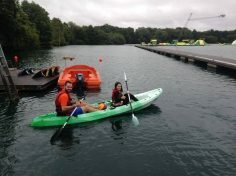 A group of 17 brave children headed to the Aqua Park and either kayaked or paddle-boarded their way around the huge lake. 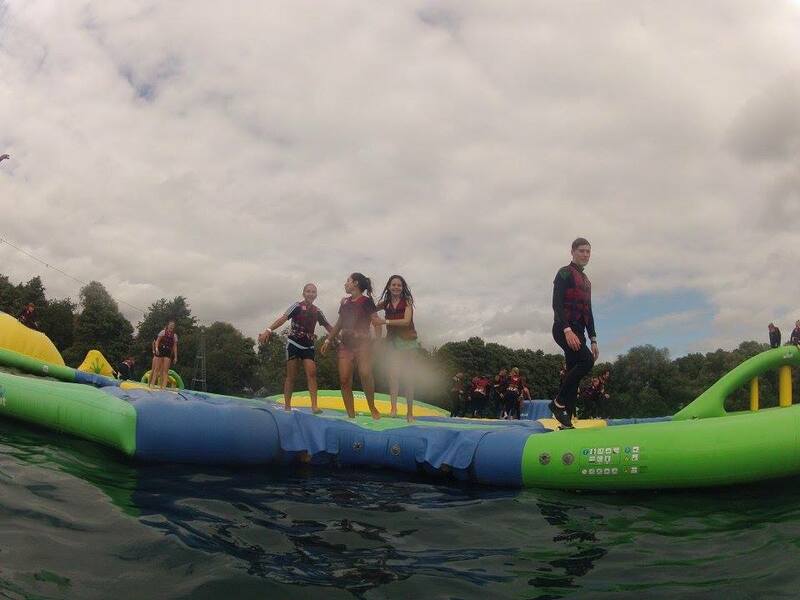 Great fun was had by all and we are certainly looking forward to returning for the inflatable challenges there tomorrow! 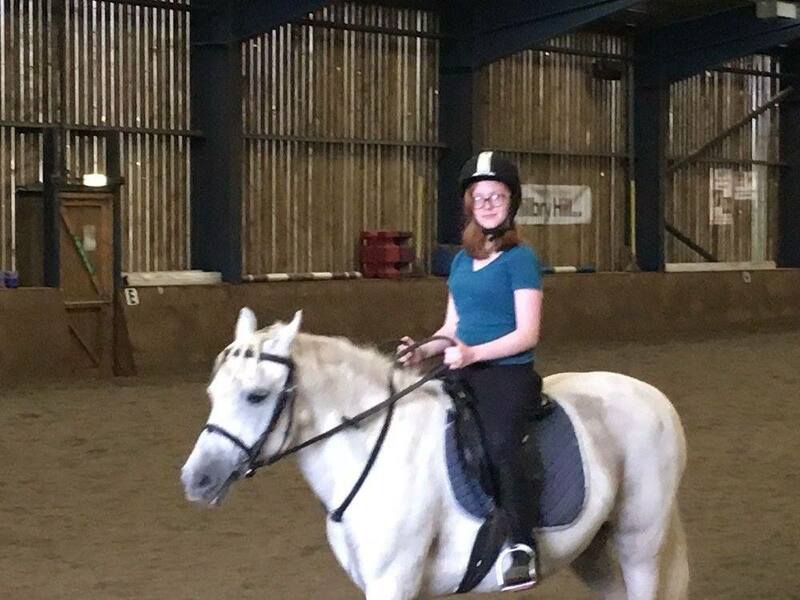 Back at the ranch, our English immersion group were in full swing and I am pleased to report great progress (along with a lot of fun) is being made by both groups. 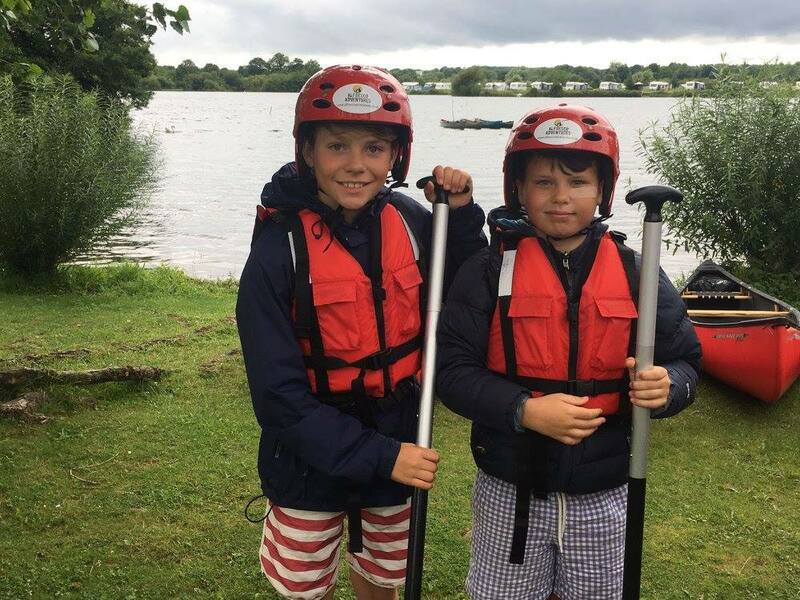 The drenched water-sports gang returned to lashings and lashings of hot chocolate and hot showers. Suitably refreshed (and now dry) the Sports Hall was turned into the setting for games and mini challenges. The group skipped, threw and bounced their way into the L&E record books. 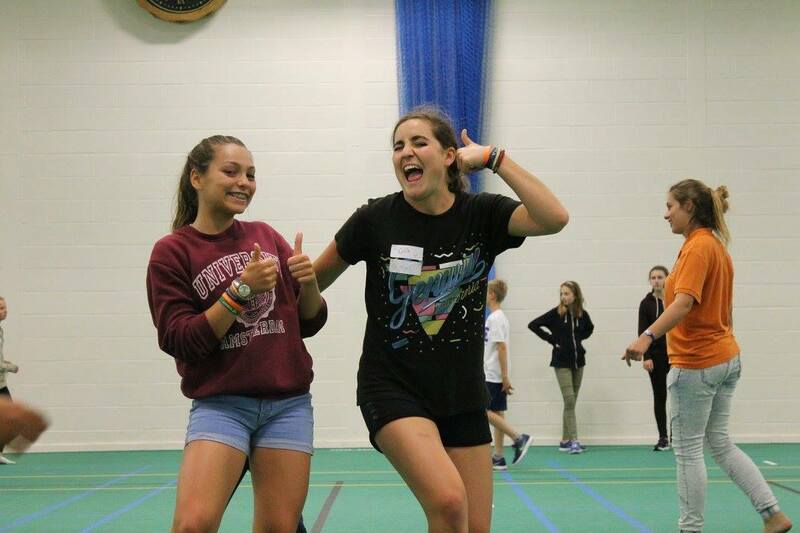 After lunch, board-games, badminton, volleyball, origami and dance-choreography were all on the menu. 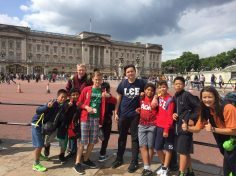 The children had great fun and Shane proved his ability to thrive in the London property market in a very competitive game of Monopoly. Dance rehearsals continued during break-time as the dance crew added the finishing touches to their routine. It was wonderful to hear the children making ‘small-talk’ and really enjoying each other’s company throughout the afternoon. Following a delicious evening meal it was time to contact home before watching the dance show. A couple of stunning solo acts from Elena and Maria who were then joined by Charlotte for a ‘Little Mix’ mash-up; the video proves just how professional and polished the performances were. Once the popcorn had popped we all settled down to watch, ‘Swallows and Amazons’ in the theatre. Pillows and duvets were strongly encouraged andI had never heard children applauding at the end of a movie before – I guess Jade and Vicky picked well! Finally it was time for hot chocolate and relaxing in the Common room. It spoke volumes about how tired some of the children are as they started to head upstairs to bed before being asked by their tutors. Sleep-tight L&E South: the sun will come out tomorrow and we have another busy, exciting and enlightening day ahead of us. 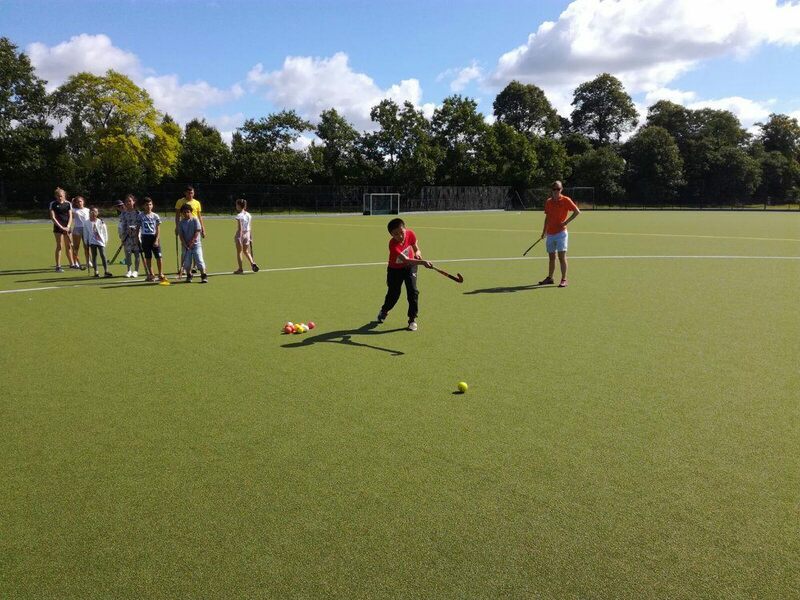 After a rainy day on Wednesday everyone was looking forward to the chance to get outside in the sun. Now, we might not have ended up with the completely rain free day Sarah had promised us but that did not stop us and the morning was filled with activities off site. 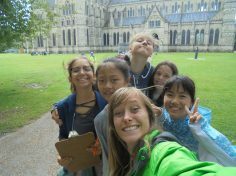 Those studying English headed into Salisbury to put into practice what they had been learning in lessons. They were split into groups and with the help of an able tutor they had to find their way around the city while completing a scavenger hunt. The rest of the campers headed out to the New Forest to explore the lovely countryside. They used a GPS device to find Geo Cache orienteering points and had to work as a team to navigate. The campers all reunited after their excursions over a lovely chilli con carne for lunch. 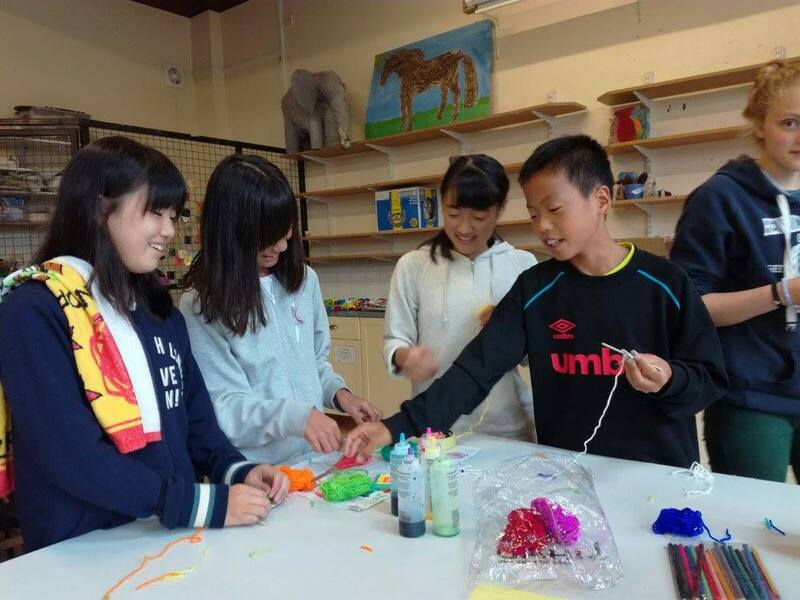 The afternoon was filled with exciting activities; campers showed off their skills on the football pitch and helped to prepare decorations for the theme night ahead of them. Half of the camp headed out for an adventurous afternoon at the water park, jumping and splashing their way around the inflatable obstacle course, lots of fun was had by all! The day finished with an extravaganza of a theme night. 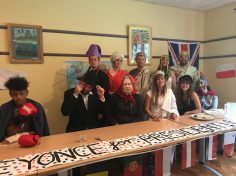 Forres Sandle Manor had the pleasure of welcoming famous World Leaders to dinner, this included Cleopatra, the Queen (x2), Ghandi, Napoleon, Teresa May, and Beyoncé. After being struck down by a natural disaster the campers had to step in and take up the mantle to lead the country. 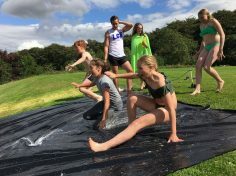 Teams competed in a range of challenges to see who would be strong enough to take the lead, some excelled in grape throwing while others showed their memory skills navigating their way across a minefield game. The night culminated in Team 6 winning the evening’s events and will hopefully be worthy world leaders. It has been a fantastic day at South Camp, and we have so much more to look forward to! As the final day for some campers approached, we were greeted with some glorious sunshine and tasty waffles and syrup for breakfast. With bellies pleasingly full, the campers headed on down for the final game of dodgeball of the week. 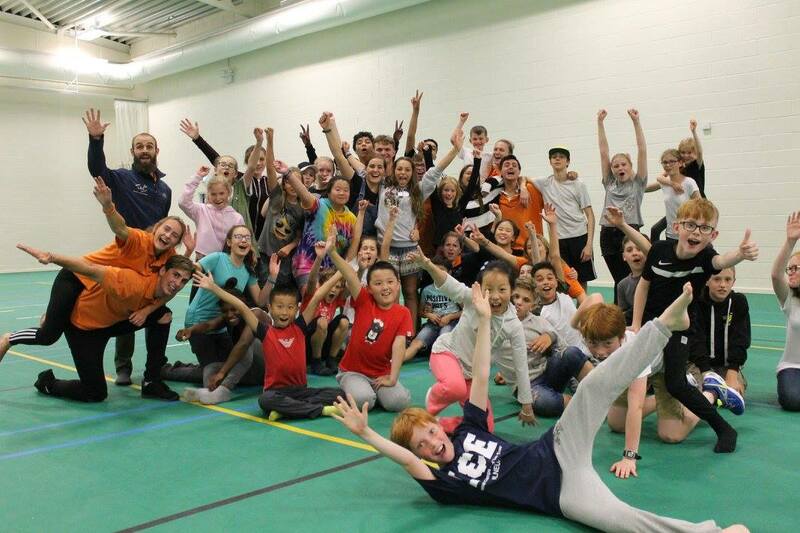 The very excitable campers (and tutors!) 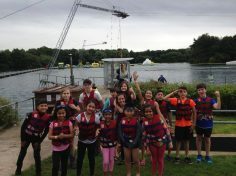 set off to the waterpark for their adventure option where they bounced, jumped and spectacularly slipped into the water and off the obstacles including trampolines, stepping stones and swings. 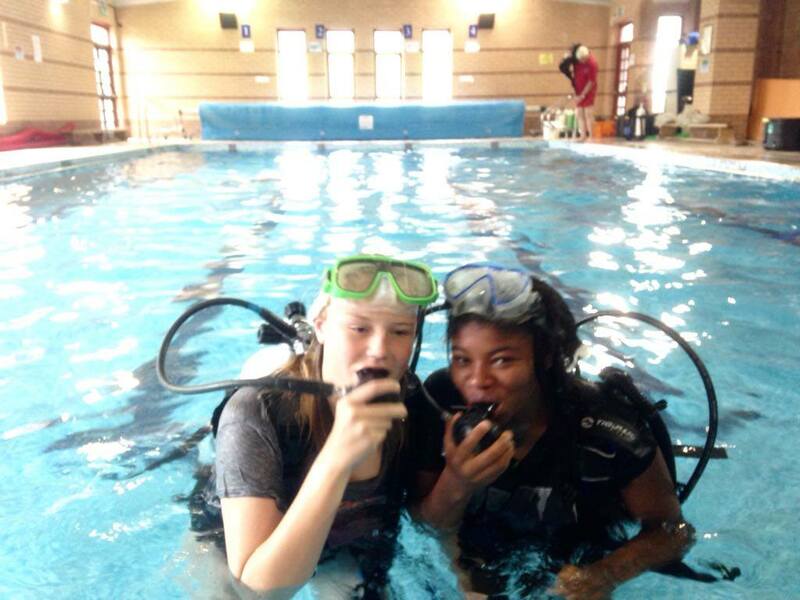 It is safe to say that Ashleigh and Rowena need a fair bit more practice before they try again! 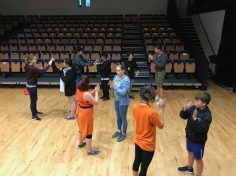 Our budding musicians got in touch with their inner song writers to create a fabulous song about the four seasons to the theme tune of ‘if you’re happy and you know it’ which went down a treat with the other campers. 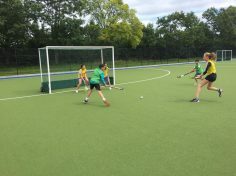 Our sporting superstars took to the AstroTurf for a hockey session with Vicki and Jade, which saw Hongjie and Josephine stand out from the crowd with their sporting prowess. A traditional English meal of ‘bangers and mash’ awaited the campers for lunch, which seemed a success as their meals vanished within minutes of arrival! 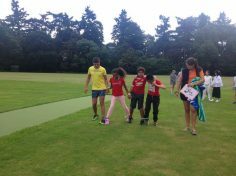 The annual L&E triathlon was postponed due to the lack of bicycles; therefore Sophie and Sammey put their heads together and created a fantastic afternoon which saw the children participate in ‘The Italian Job Relay’. This saw the children split into groups and competing against each other to win more tools and ammunition for the water fight at the end of the afternoon. The children took part in 5 different team events, a ten legged race, a penalty shootout, a Mario-cart timed race, a swimming drag race and ending with eating a biscuit in the fastest time. Hawaiian took the winners medal which resulted in the ‘Pizza’ half of the campers gaining access to water pistols and more water balloons than the ‘Pasta’ team. A quick dip in the pool to warm up after the water fight and a fantastic afternoon of team building, meant that the campers had plenty of time to get themselves ready for the upcoming Oscars evening. 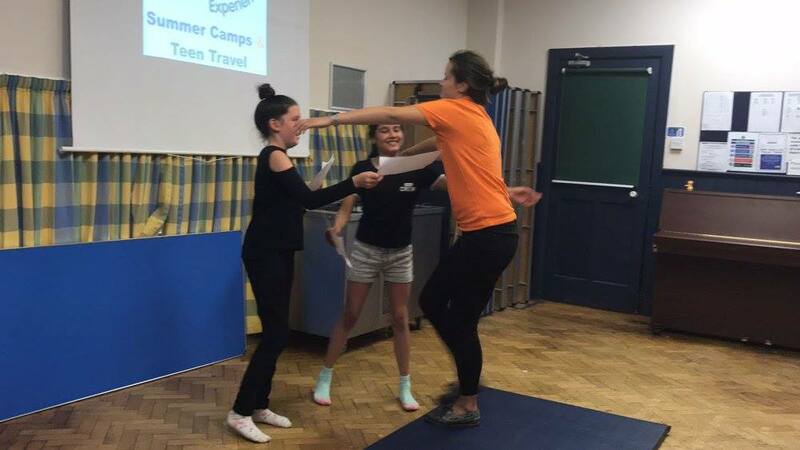 An important part of L&E tradition is to celebrate the achievements and successes that the campers have shown throughout the week and we almost certainly weren’t short of these moments tonight! From Ghassan the camp joker to the kind Beatrice, we had plenty to cheer about. 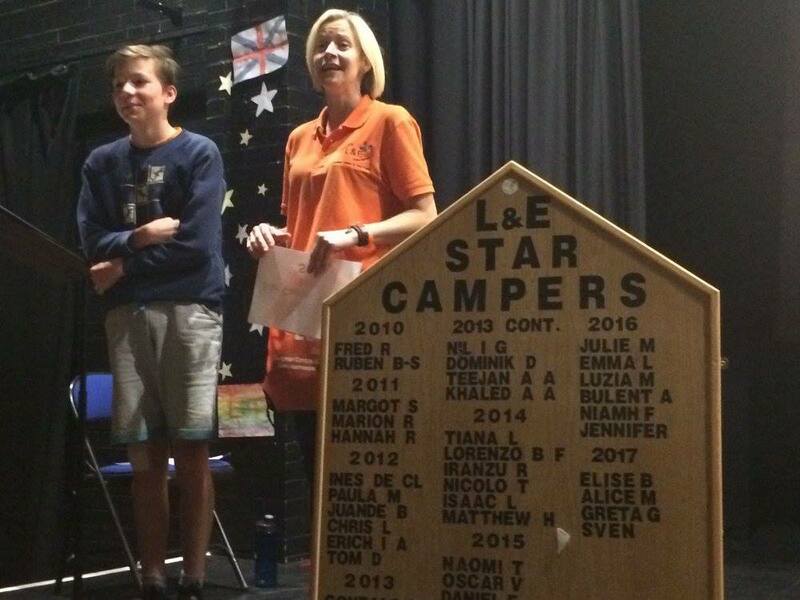 The deserving Moin had the honour of being the recipient of the first ever L&E South camp Star Camper award which is fully deserved and he goes home with some super exciting L&E merchandise to wear! 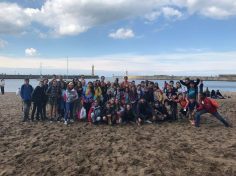 As the first week of L&E South comes to an end we can look back at some fantastic memories and some wonderful friendships created. We say goodbye to a few campers and hello to a few more on Sunday! But first the campers have a very exciting trip to London tomorrow so are tucked up in bed getting some rest ready for an incredibly busy day! 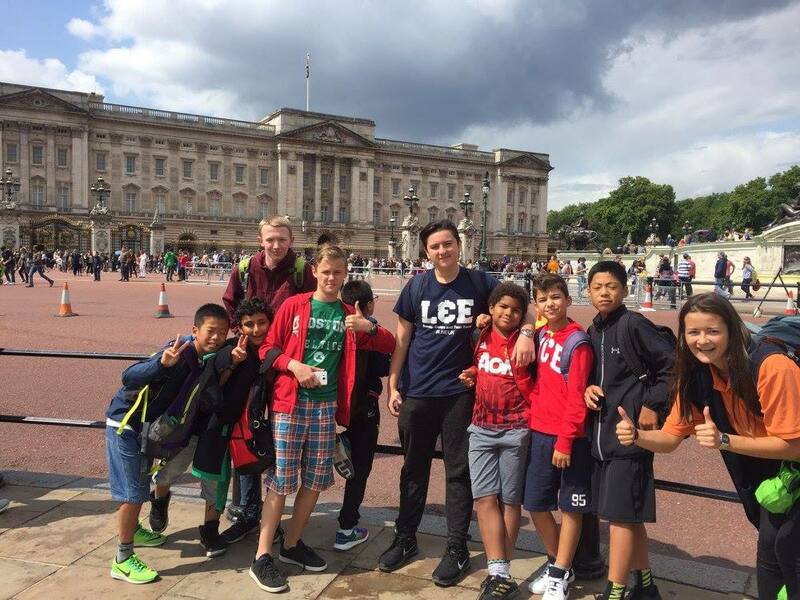 The campers from L&E South Camp ventured to the big smoke today to explore London and all its glories! 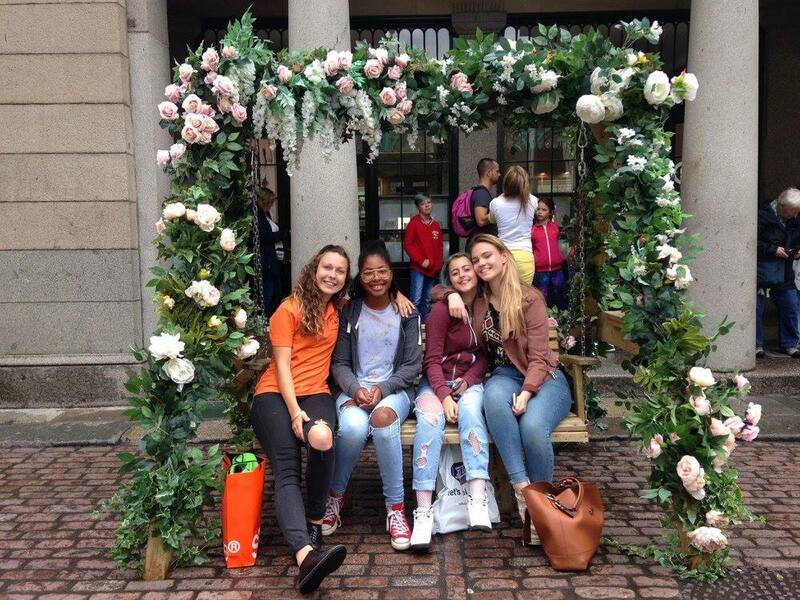 They managed to fit a huge amount into the day visiting the Queen at Buckingham Palace, Covent Garden for some shopping and spent some of their pennies in many of the wondrous shops. 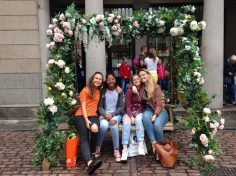 Campers visited Harrods to window shop, for many international designers, and then spent some time roaming the food hall to see all the wonderful pastries. They had a great time in Hamley’s checking out all the new and top toys for 2017! They also enjoyed the delights of China Town and many Old English Sweet Shops along the way! They picnicked in Hyde Park, enjoying the beautiful flowers blooming and one of the groups managed to get to the Science Museum and were blown away by the natural disasters exhibit. 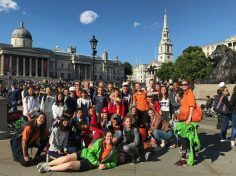 With tired legs, bellies full of ice cream and sweets and smiles on their faces, we left the big city to head back to camp. It was a wonderful day, with lots of new experiences, laughter and most importantly great friends to share it with. 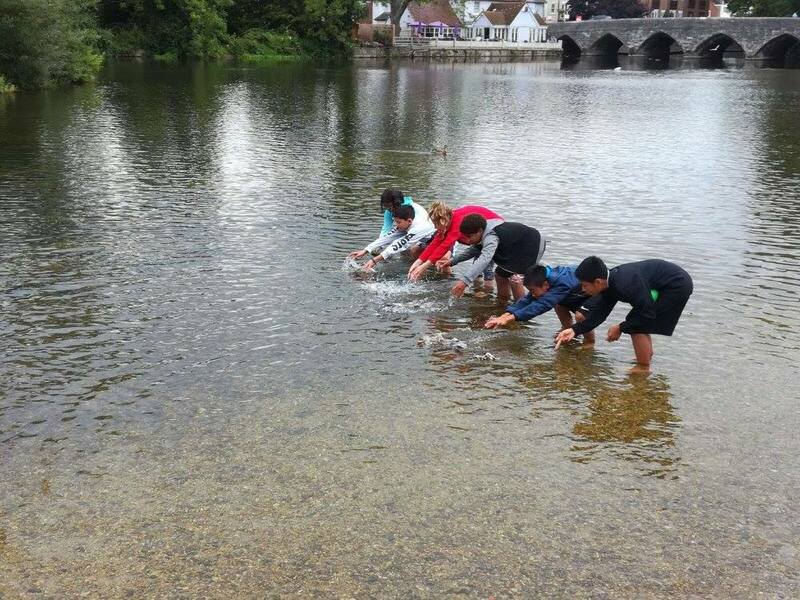 It has been a busy day here at L&E with a group of campers off to Oxford for the day and the other ventured to the delights of Fordingbridge where they paddled in the river, explored the village and saw the sweet shops! The weather was very kind to us and there was lots of smiles and excitement over the visiting ducks. 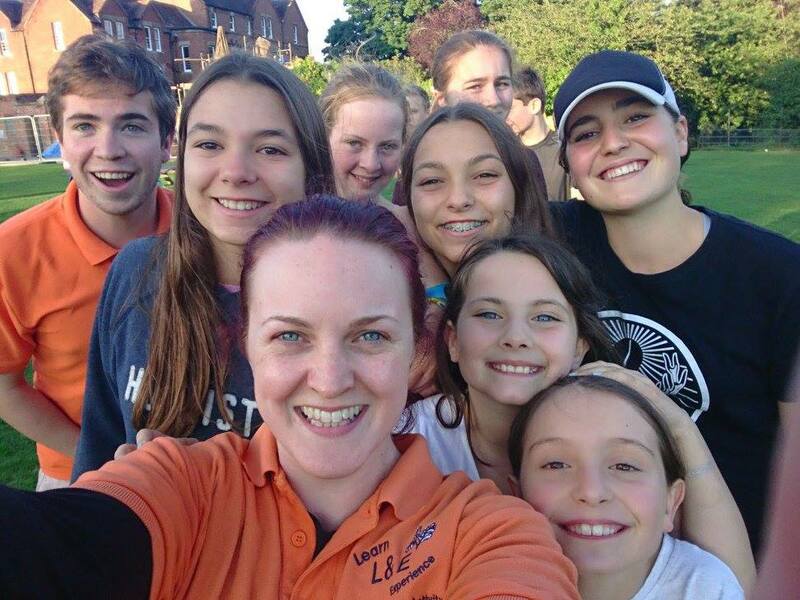 This evening, the many happy South campers welcomed lots of new faces to another fantastic week of L&E! Lots of seasoned campers helped the new children to their dorms and then we enjoyed a glorious BBQ on the terrace. Then the fun began! 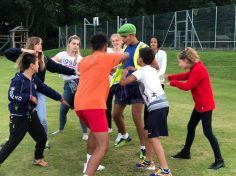 Many games were played on the field including a very heavily contested game of capture the flag. 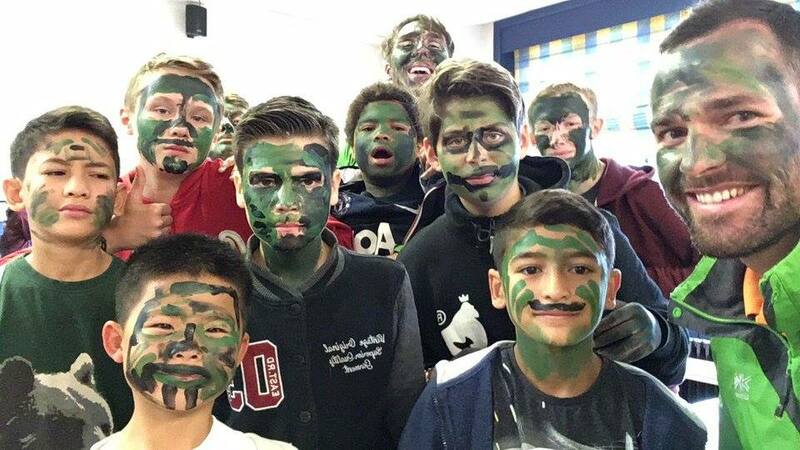 There were some very impressive manoeuvres from both tutors and pupils to avoid detection in enemy territory. With hot chocolate warming their bellies they went off to bed and although took a while to quieten down, they are now asleep unaware of the incredible plan the tutors have devised for the week ahead. Day one, and what a ‘rippa’ of a day it was. 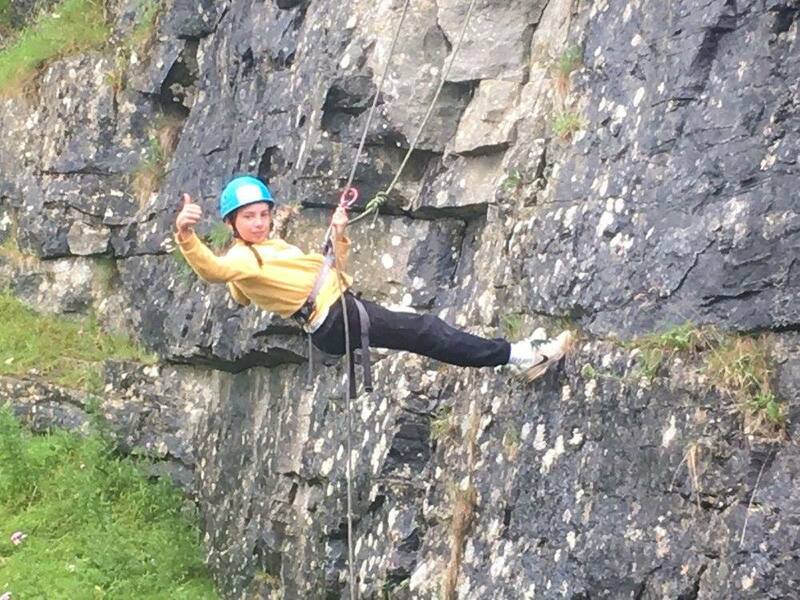 From surviving the waters of Fordingbridge, to making sure impacts from heights were going to make crucial members of our team not crack…as the wise Mr Dumpty once said “Humpty Dumpty had a great fall.” Time to get serious though, all the kids were safe throughout the whole day. The morning began with our usual breakfast but a victory was foreseen in the future but what was it to be? Some kids to finally shower? 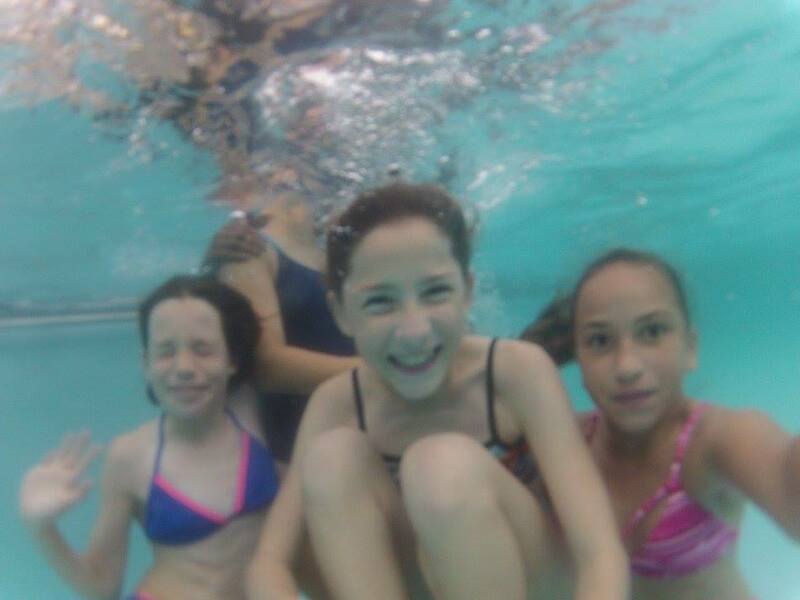 Sammy to keep her clothes dry while swimming? Or none one to trip up the stairs? However, low and behold, the Tutors finally won dodge ball against the kids, not once but twice! 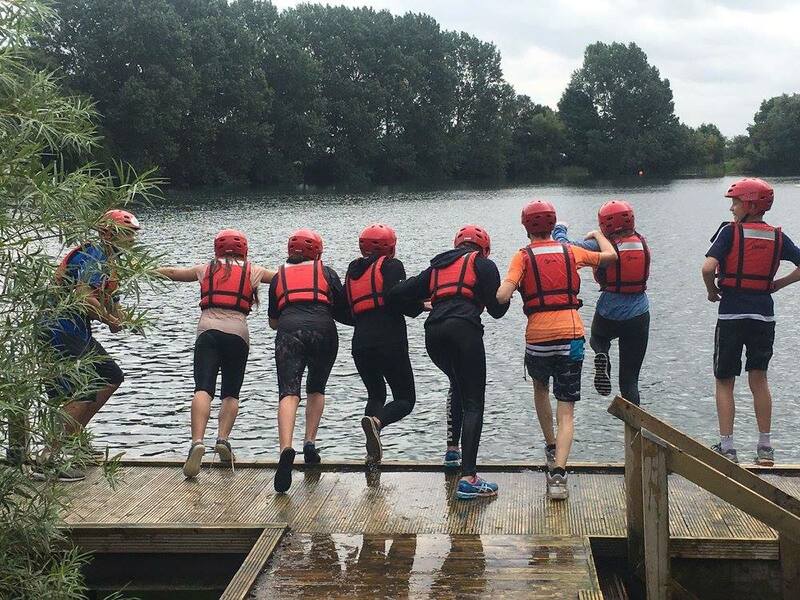 After the great celebrations by the Tutors, the kids then chose to either build mini rafts to race down the river in Fordingbridge, lifesaving skills in the pool or create a dance video. At one point, Will thought he could walk on water during the lifesaving skills session but, needless to say, he ended up quite wet. We are yet to see this dance video but after hearing the stories and hearing the laughter, one can only imagine how great the video will be. 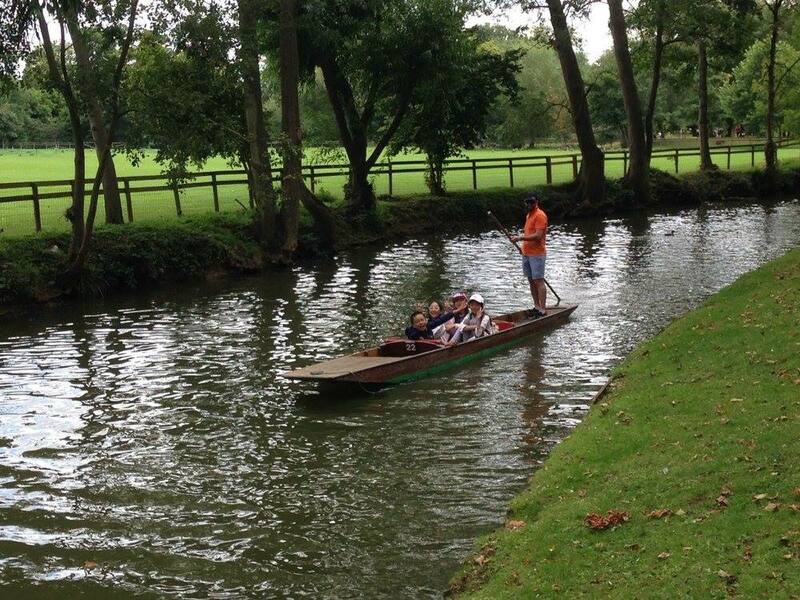 Mini raft building was a great success, not one raft sunk and all managed to finish the race. The day seemed to race away and the ice breaking evening was soon upon us. Get to know bingo was lots of laughs with Amelia taking home the bragging rights with the win. Teams were then formed and eggs needed protecting from falling from great heights. Surprisingly 4 out of the 6 teams managed to protect their egg from the world champion egg thrower Sarah and weren’t they proud of it. By the end of the night, many laughs were shared and new friendships made. Today the heavens opened but with ham and cheese croissants for breakfast, and 3 out of 4 wins for the kids in dodgeball, L&E wasn’t rained off. The day began with many exciting activities. In sport, a moist game of tag rugby. 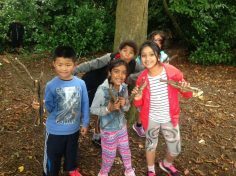 Our young adventurers set off on a Bear Grylls hike to the forest to build a log den and out mega-huge creative group of magnet makers, sculpting treasures to stick on the fridge. The English group learned about hobbies with a classic game of pictionary with big man, Will. Lunch was beef or mushroom and broccoli pie with lots of lovely jelly to get us wobbling onto the next activities. The adventurers bounced off the inflatables, at The New Forest aqua park with a particular shout out to Mr Oliver who fearlessly climbed the iceberg and leaped off without a crumb of fear! 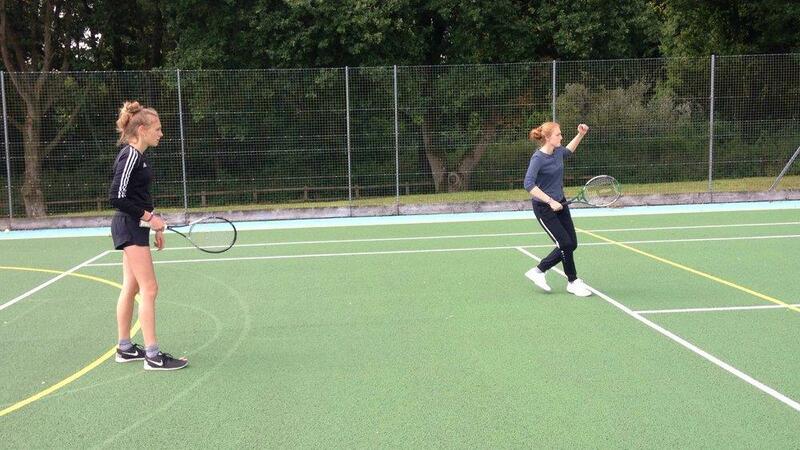 Others laughed their way through a benchball session, showing off their mad skills with the tunes booming. Another group of campers headed to the stables to ride some elephants/horses. 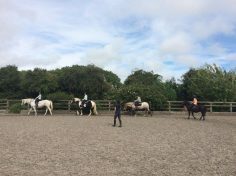 There was notable improvement from everyone, particularly the beginners doing rising trots on their second day, yeeeehaaaaah!! 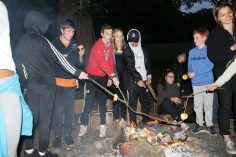 Water polo in the pool, fajitas and chocolate brownies for tea then off to the bonfire for some games, songs and marshmallows. A huge variation of performers and languages, learning campfire songs that we will always remember. 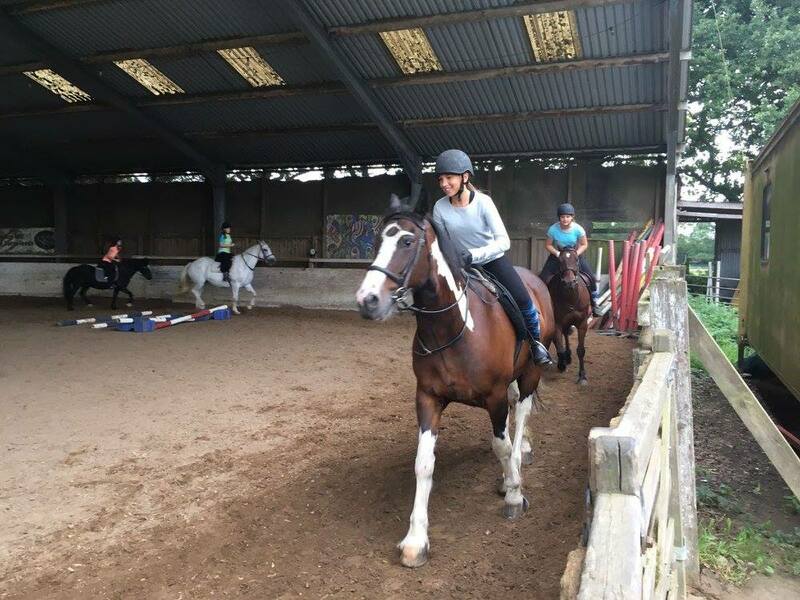 Everyone’s confidence is building, friendships are becoming stronger, brains are boggling and fun is bellowing throughout our beautiful L&E South camp. 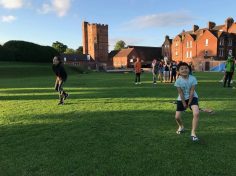 After a scrummy breakfast, mid-week of camp commenced with the usual lively game of dodgeball, which never fails to get everyone up and ready for the day (even with the dollop of British rain). After the warm-up, the English class started a show-stopping morning of screen-play and story-writing. Sequined masks, pink feather boas, flamboyant hats and giant glasses aided the prodigy actors and writers. 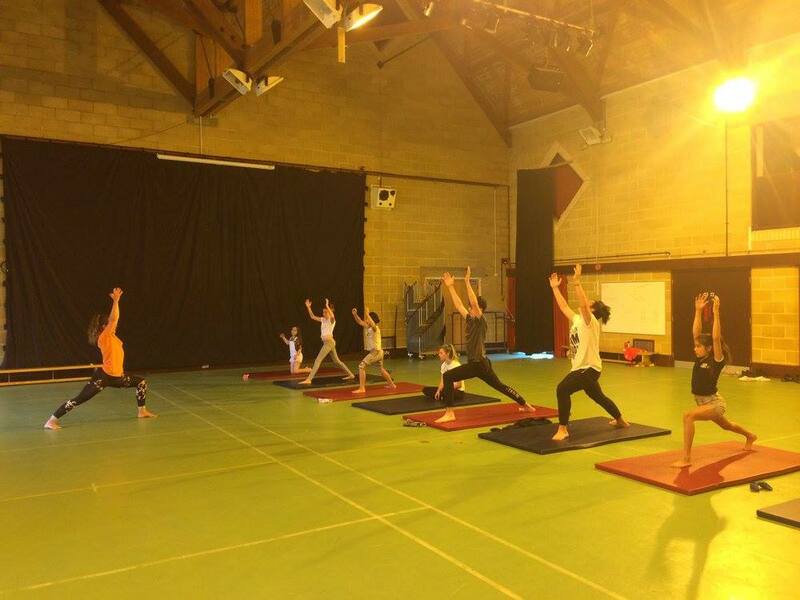 The new L&E sport activity of Acro-Yoga proved to be a great hit with the campers. All sorts of shapes and balancing acts were performed by the budding acrobats/yogis with mind-blowing flexibility and strength! Meanwhile, the creative among us had a tie-dye session, where white t-shirts were transformed into multi-coloured spiralled art-work. 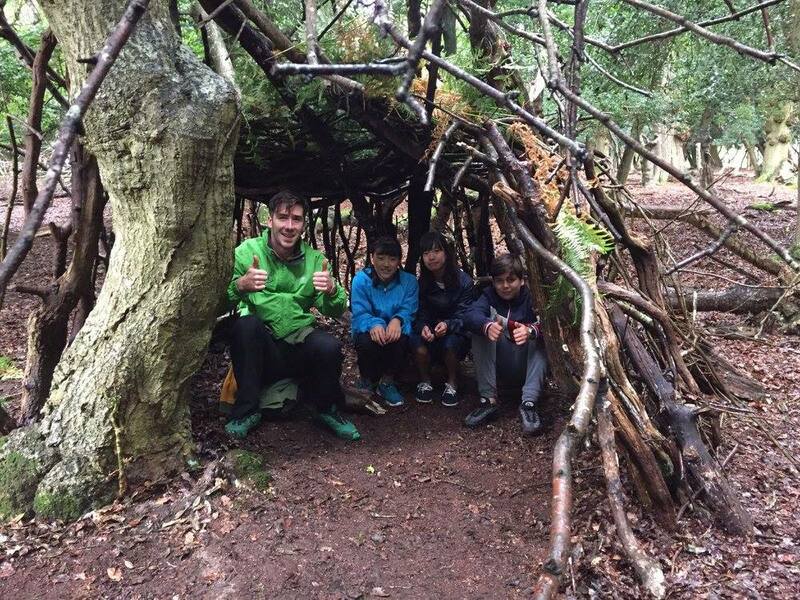 Over in the woods, the adventurous were ‘cameoed up’ and preparing for survival. ‘The Island with Shane and Wilson’ (release date Feb 2018) involved the campers using natural tools to make dams, fires and dens; in order to overcome the natural elements. After a feast of meatballs and pasta for lunch, the afternoon kicked off with a badminton and table tennis extravaganza tournament. The winners were Yu and Shizuku in badminton and Daniel and Adam in table tennis. 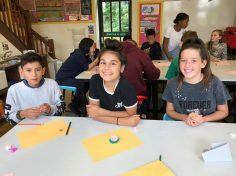 In the art room, vibrant paper-mache dragon egg making and face painting captivated the young Picassos. 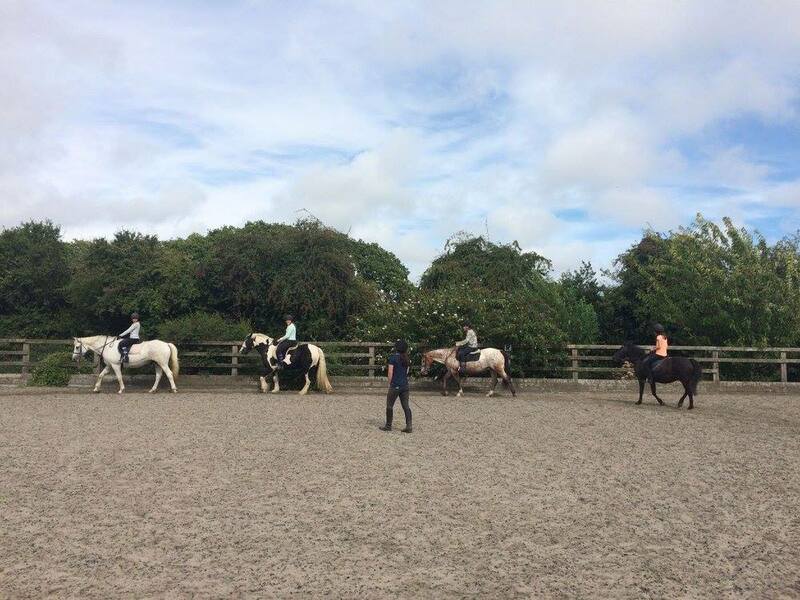 The adventurous horse riders had another fantastic day where there was great progress with all the riders. 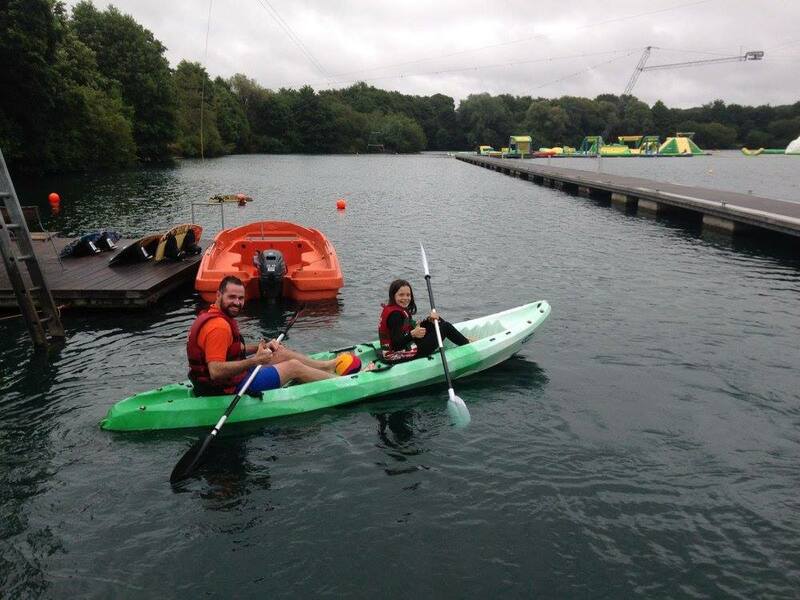 The last of the campers went to the water-park for a whirl-wind adventure of kayaking and paddle-boarding. After an exhausting day, the campers had a relaxing evening curling up in their pyjamas and duvets to the classic movie, “School of Rock”. The campers awoke to sunshine and another day of fun. Set the day up although everyone was pooped. Everyone enjoyed the rapid motion. While in water polo, the players defended. And the adventurers took on photo orienteering without their fleeces. A wonderful afternoon in the sunshine we spent. Heading back to the bus, queue the cliff-top singing. Trying to bring Darth Vader back to the good side. Hot chocolate followed, we all hit the floor. On the penultimate day of camp, it was a very weary start as the campers made their way down the stairs to breakfast. 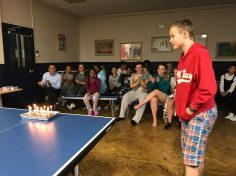 With the breakfast bell ringing, a few more times than normal, campers finally followed the smell of Belgium waffles which wafted from the kitchen. 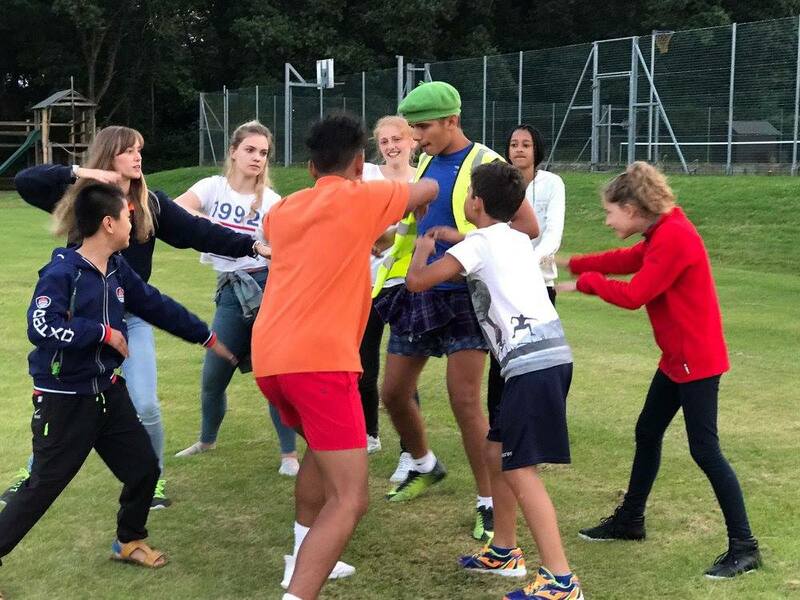 With camper’s bellies full, it was time to dodge, duck and weave in the grand final of the tutors vs campers dodgeball rivalry. The soft ball whizzed around the hall, flying millimetres from campers as they dove out of the way of the tutor’s wrath…well that is how we saw it. The tutors were cowering from the onslaught of dodgeballs being hurled their way. They managed to pick it up in the final game, but in the end, it was another devastating loss. After our morning warm up the campers went off to their morning activities. 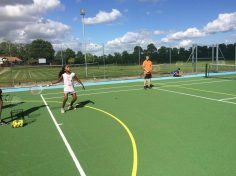 The sport group tried their hand at some tennis and hockey, pushing a pulling the hockey ball across the artificial surface whilst a mini Wimbledon game was going on. The creative students painted their clay sculptures in the sunshine appreciating the natural beauty around them. 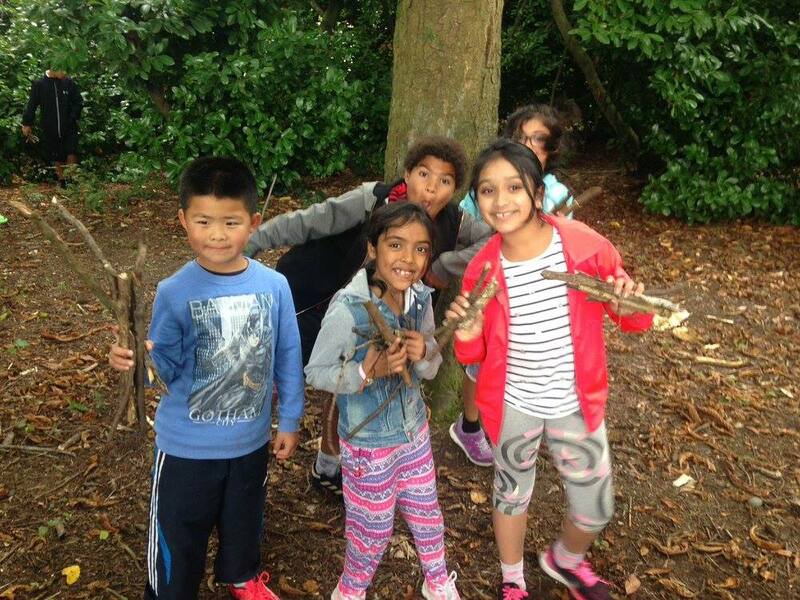 The adventurers tried their hand at some campfire cooking, with some very damp logs! Lunch was a feast of a truly English classic of: sausages, mash and beans! 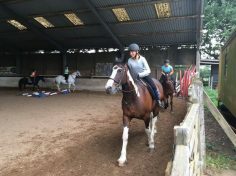 This afternoon a group of campers went for their last horse riding lesson and had a lovely time galloping around the stables and managed to do some little jumps on their ponies. 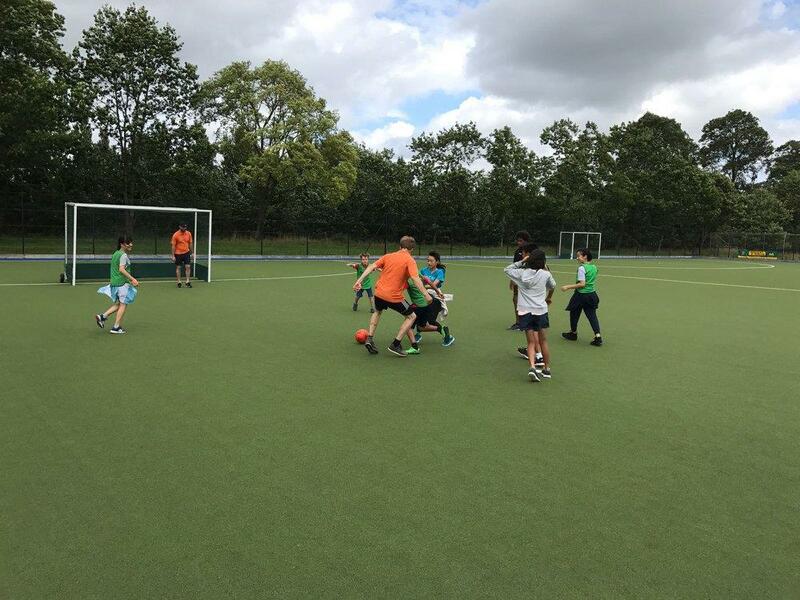 The rest of the camp participated in the weekly sporting competition. 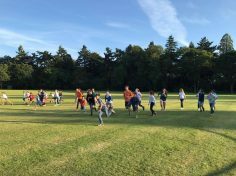 This week it was a mega triathlon, seeing all campers giving it there all in either their individual events or team efforts! Everything was leading to one of the main events of the week, the Oscars! Supper was filled with chicken nuggets, chips and lots of excitement for the impending awards ceremony. The evening was filled with acro-yoga presentations and an extraordinary music video from the creative crew! Many of our campers were awarded for their talents and kindness, with Novella being awarded out Star Camper of the week! 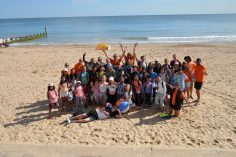 It has been a fantastic two weeks of South camp and with a slightly heavy heart we say goodbye to the 2017 summer of L&E, which has been filled with many smiles, new friends, experiences and most of all a summer of fun! 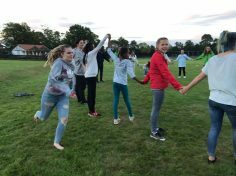 As the final song ‘Grease lightning’ brought the disco to the end, there were many tears and hugs as the campers said goodnight to the final time. It has been a blast L&E! We can’t wait till next Summer! 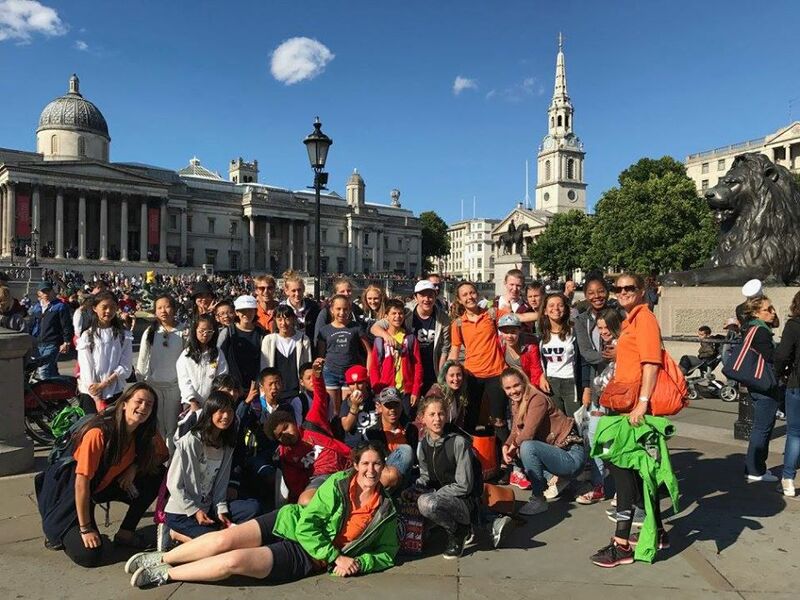 The campers slowly filtered into Aysgarth School this evening from all across the globe, coming from as far as Hong Kong! 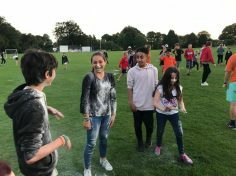 After enjoying a BBQ the kids said goodbye to their families and got stuck into the evening activities. The first evening gives us the chance to get to know each other through some fun camp games, which everyone gets involved in. Tonight we began with packman, a camp game that mimics the arcade game as the children follow the designated lines in the sports hall making sure they do not get tagged. We then play a game of Zap, which is a game of fast reflexes and instincts. Following that we played various forms of what is called stuck in the mud in the UK, this tests kids balance, cunning, agility and speed. 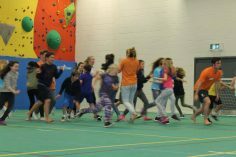 Following that we played a game of fruit basket, which is another game of concentration and speed, as children sprint around the gym in teams attempting to be the first into their respective fruit baskets. 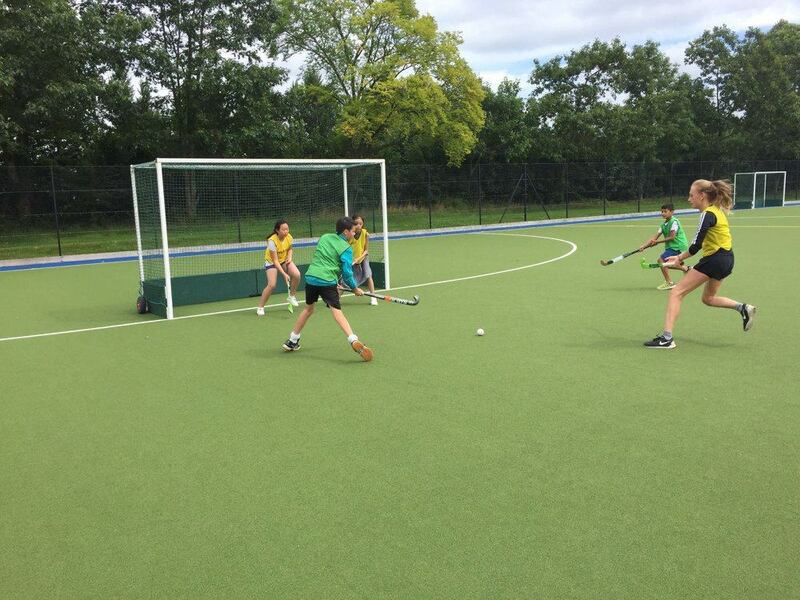 Finally we finished the games off with a classic camp game of 40/40, which is a mix of hide and seek and tag. As you can probably tell the evening was jammed packed and following the evenings activities we came in for a hot chocolate to relax before getting ready for bed. After giving a small talk, giving the kids an idea of what lies in store this week, we all went up to our different rooms for the evening and got to know each other a little before settling into bed. 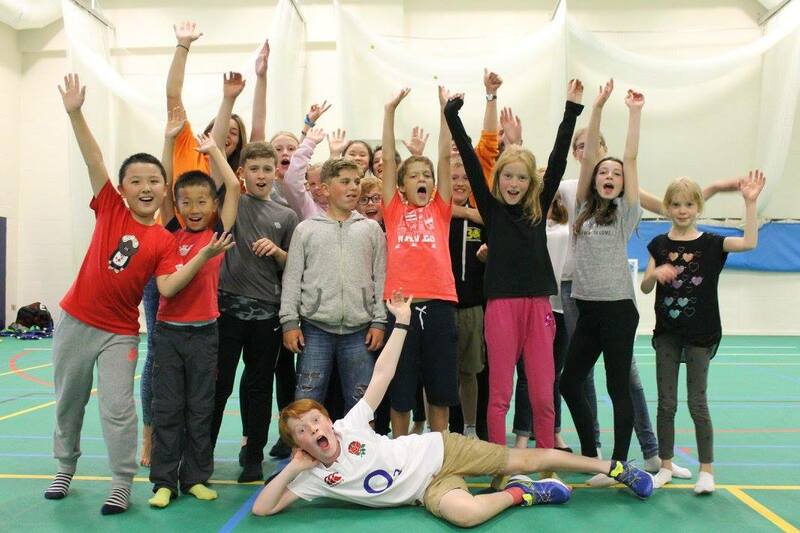 It has been a great first evening and we’re sure it will be a brilliant week with a brilliant set of campers. Our final week’s campers woke up surprisingly early to beautiful sunshine (for ten minutes) and tucked into eggs and soldiers for breakfast. The group then headed down for their dodge ball debut, which they all enjoyed. After wiping the floor with the tutors, the campers then chose their morning activities: the creative kids brought their consequences stories to life with the magic of multimedia, the sportsmen and women amongst us battled the blustery conditions during a morning of tennis, and the adventurers headed off in luxurious Lenny (the Land Rover) to Aysgarth Falls where they wandered alongside the torrent that has become the River Ure since our last excursion. Safe to say they would not be swimming today, but it was an enjoyable outing all the same as the weather held up until we left. After filling up at lunchtime, the afternoon activities commenced. Sport was volleyball, which went down a treat, and in the creative session the campers completed the other half of photos of our very own tutors. 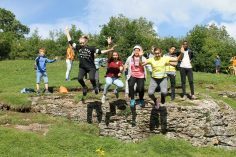 This afternoon’s adventurers returned to Aysgarth Falls, where they explored another part of the river, in awe of the raging rapids. 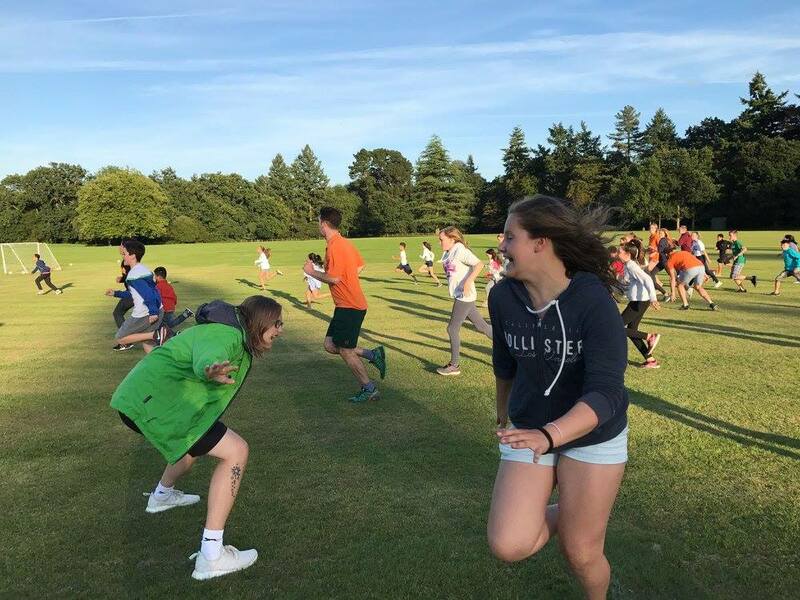 After some hill rolling races and an ice cream to cool us off, we headed back to the homestead for an evening of icebreaker games. 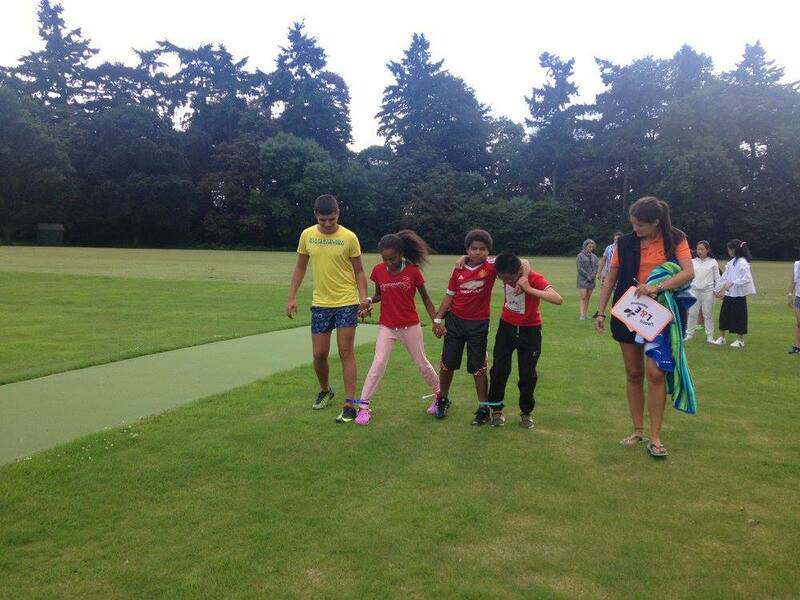 Campers new and old became friends as they worked together to complete challenging tasks set for them by our tutors. The games flew by as the sun set, and everybody gathered around for the grand finale – the egg drop. 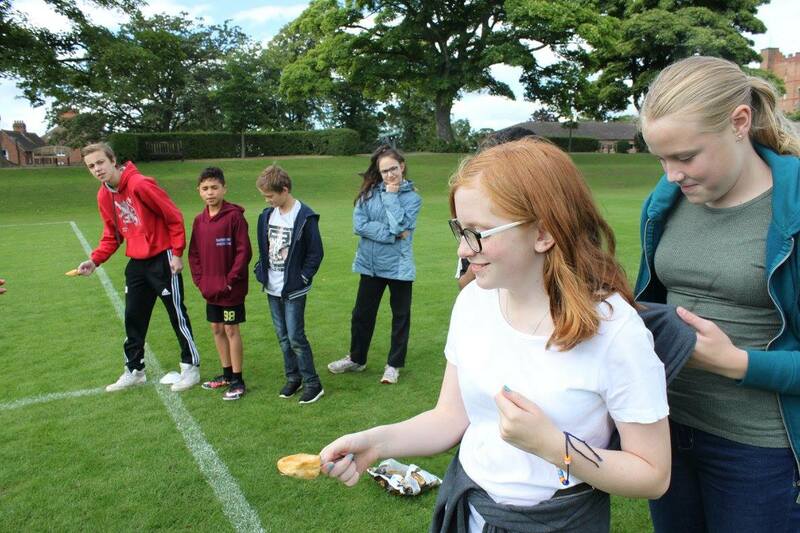 Each group’s eggs were secured using the various items provided, and we all watched on as eggs were either scrambled or saved by the campers’ eggcellent inventions. Many were scrambled, but a few were salvaged! Hot chocolate and bed ended the exciting evening, with all the campers ready and raring for the week ahead. 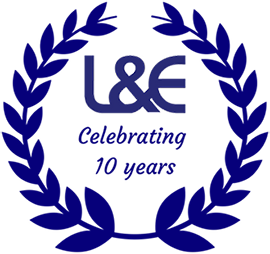 The 1st August, a date all L&E North Campers will now remember as Yorkshire Day. 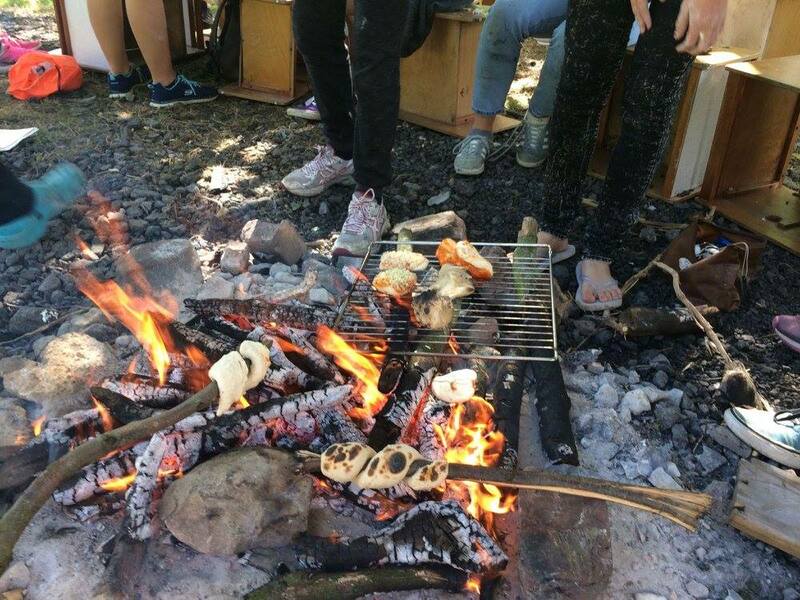 Waking up, the campers were treated to a traditional Yorkshire morning of sunshine and croissants… okay, maybe not quite traditional, but still fantastic! The morning consisted of a variety of exciting activities: the creative bunch made eye-catching dream-catchers, which will ensure your loved ones are sleeping safely and soundly tonight. 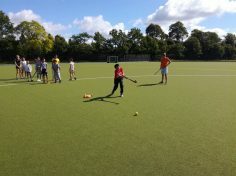 On the other hand, the children with a little more energy were put through their paces in an intense sports session. 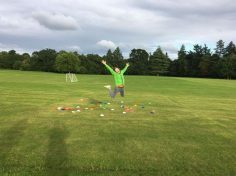 The children played Ultimate Frisbee, Handball, Benchball and some high-intensity catching games. 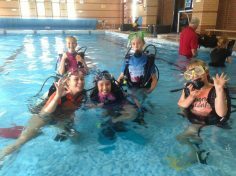 As well as this, Tuesday is of course ‘Scuba Day’ which meant our experienced divers got the chance to show off their skills, and new divers got the chance to try something amazing. After a filling lunch of sausages and Yorkshire puddings (not the last you’ll hear about these), the campers got the chance to scuba again. 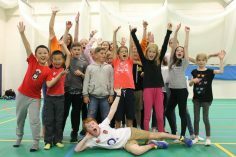 As well as that, the sporting bunch got the chance to showcase their footballing skills, and excitingly, the creative children built their very own paper- airplanes – these weren’t your average paper-airplanes, they were carefully crafted, intricately designed flying machines. 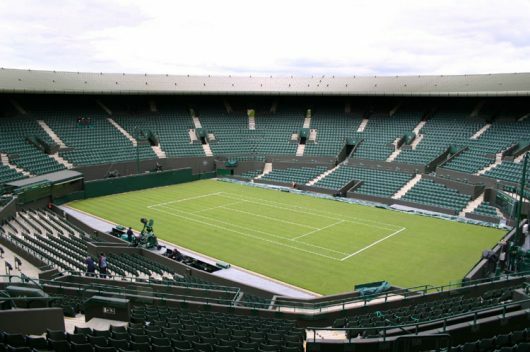 Then, it was time for the big event itself: the Yorkshire Olympics. You may be wondering what this is, and you’d be right to do so because it’s something we invented today! 7 events, all of which somehow involved the use of Yorkshire puddings. 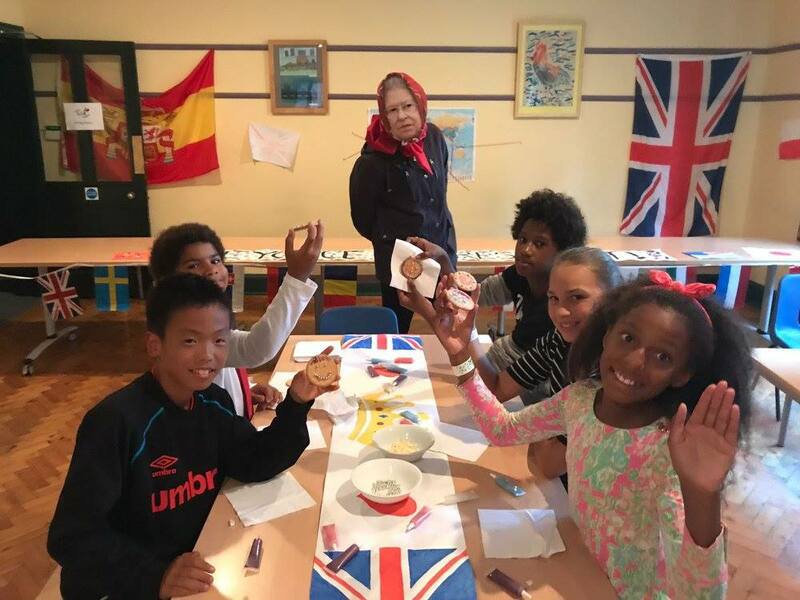 We had children throwing, catching, kicking, carrying Yorkshire puddings all afternoon, as well as developing their understanding of local phrases. Never before has a Portuguese girl uttered the words, “Ey up r kid!” Come to L&E if you want something new and different! 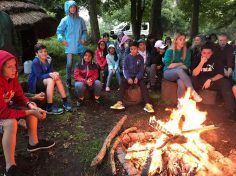 After a relaxed evening swim and tasty tea, the children headed down to what was to be the final campfire of the year for the North Camp. 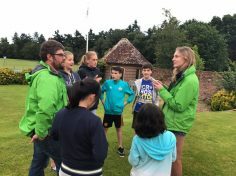 This meant that the children were singing merrily away, with older campers keen to teach newer campers the songs they’d learnt. 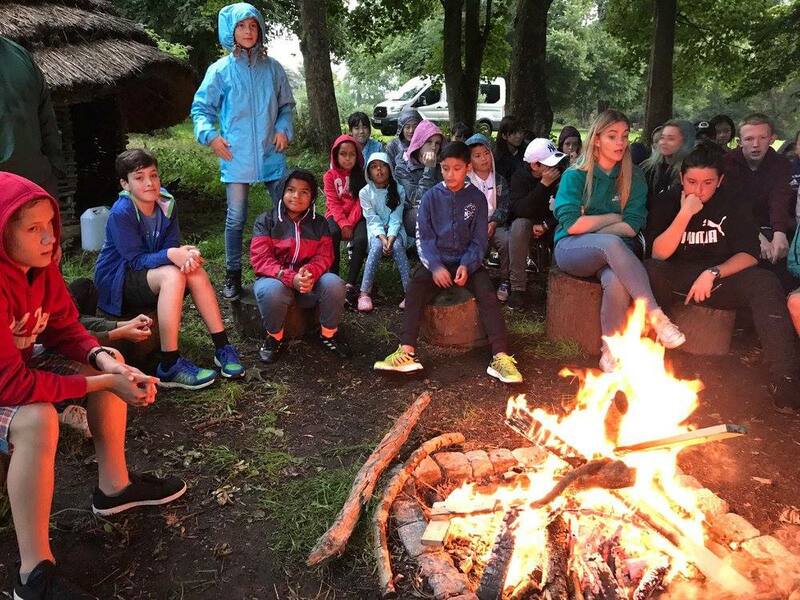 The tutors watched in awe, as seemingly shy and quiet children got up to belt out their favourite songs, as everyone laughed and joked around the blazing fire. Instead of marshmallows, the children toasted Yorkshire puddings around the fire and were giggling away at their amusing end to the night. Rest assured though, the children did get their marshmallows in a comforting hot chocolate before bed. The perfect end to the perfect Yorkshire Day. Yet another blissfully rainy day fell upon L&E, however the children hopped out of bed and got down to breakfast just as normal. After brushing their teeth the traditional dodgeball games were played with courage, honour and massive throwing arms being displayed from both sides. After the dust settled from what was a fearless dodgeball battle the children chose their morning activities. The creative option was egg protection. The children had to engineer a protective structure or design to make sure an egg could safely land once it was launched into the air by a water balloon cannon. Michael’s egg was the only one to survive the landing. 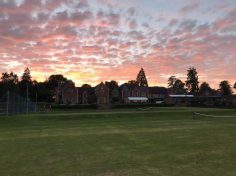 The sports option was quick cricket, with enthusiasm and warm catching hands the children began playing adn some incredible catches were made and countless runs were made. 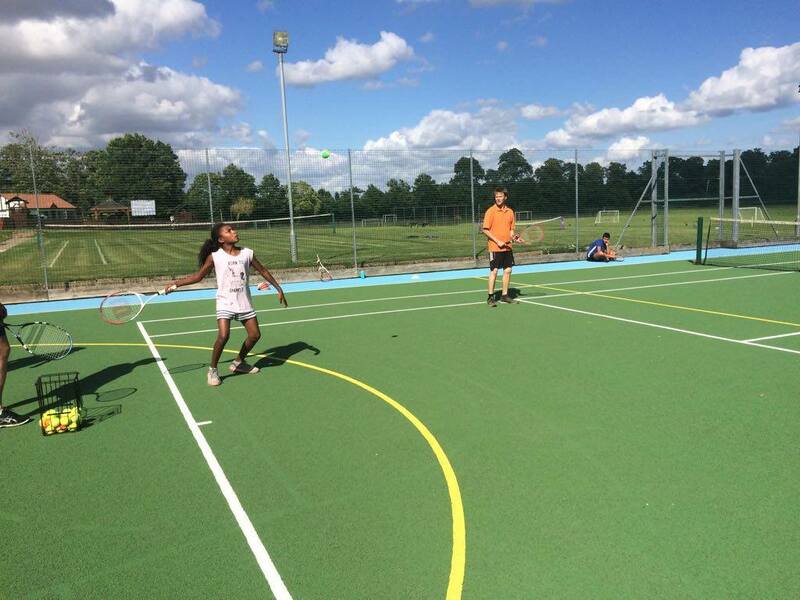 Special mention goes out to Panashe for his two stunning one handed over the head catches. 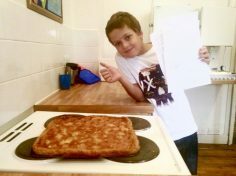 The activity for those who selected English was pizza making. 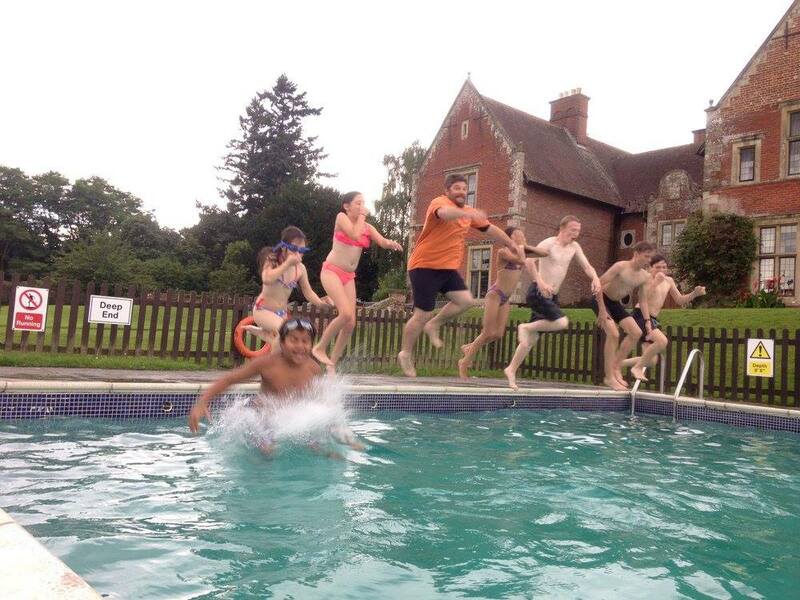 After the rest of the camp heard that there was a sudden influx of new English students! After a hearty lunch and a little down time the children began their afternoon activities. 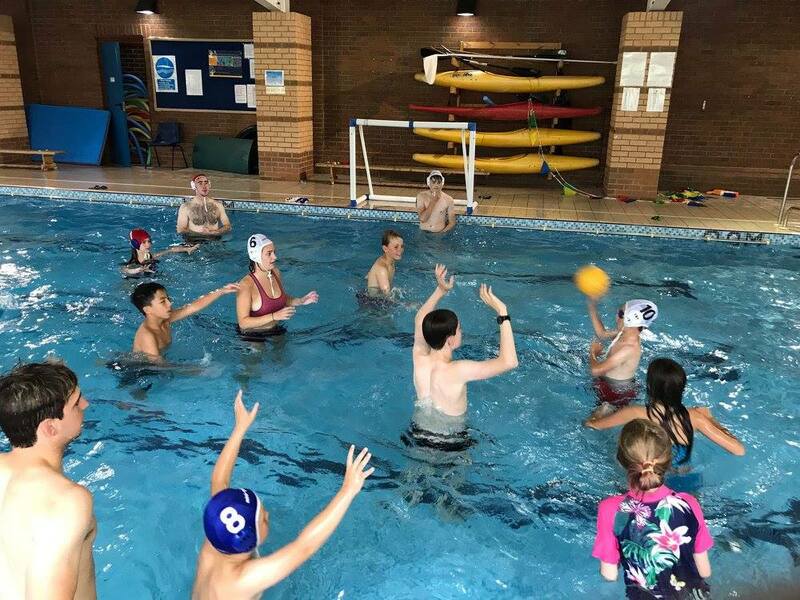 The sports option was water polo which came out as one of the more popular options. 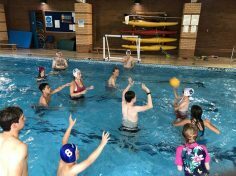 Water polo in itself is a difficult game, however the children took to it like fish to water. The creative children dabbled in a little Coca Cola and mentor rocket building as well as water rocket building. After launching the water rocket so far that they lost it, they began on their Coca Cola rockets. 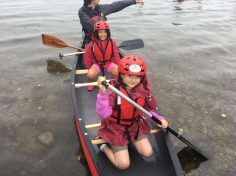 The adventure option that was run throughout the day was canoeing, the children braved the cold lake in canoes, paddling around having a blast. Once the rain began the canoeing came to a stop and the children jumped off the jetty into the lake. After a long day of full on fun, adventure and creativity the children watch a movie tonight to wind down. Following the movie is a delightful cup of hot chocolate to set them up for a good night rest. 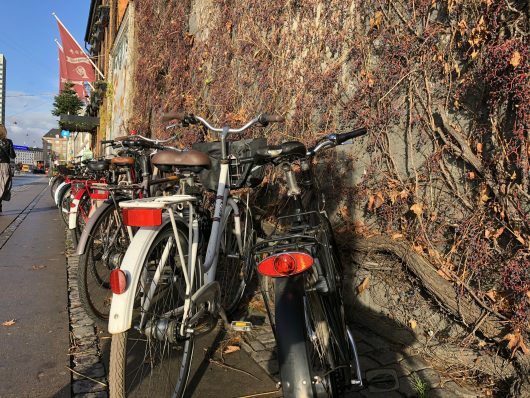 The day ends with the tutors visiting their dorms and having chat with the children, jokes are made, advice is given and as the tutors leave the room the children fall asleep to get rest for the next day. 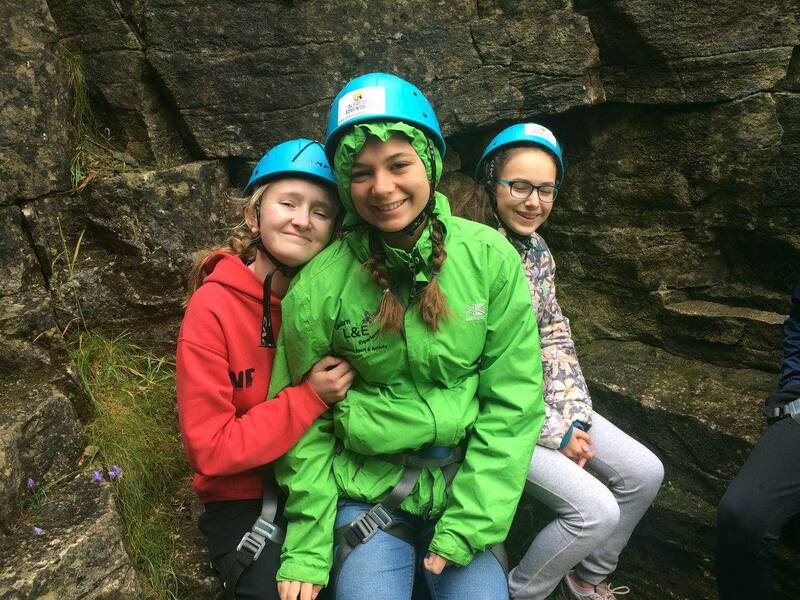 The morning arrived with some heavy showers as some of our campers braved the conditions to go rock climbing and despite the cold and wet weather the kids had an exciting time in yorkshire’s stunning natural settings. The others stayed on camp to enjoy some morning Yoga inside swell as some dodgeball. After dodgeball the morning activities started which included boardgame making, where we tested the kids inventiveness and saw who could designthe best new game. 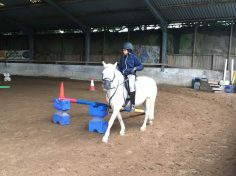 We then tested out the finished products having a great time. 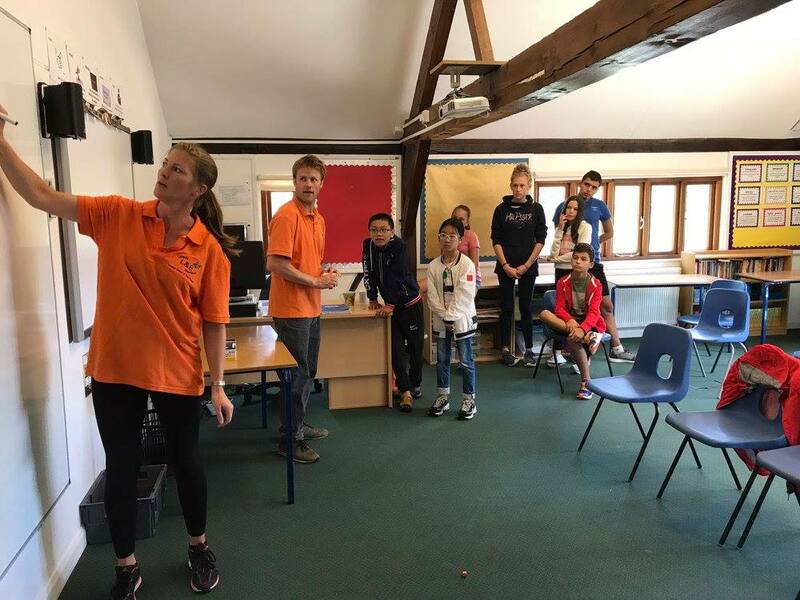 In English everyone enjoyed a murder mystery game, where an elaborate plot was created by the teachers that the kids were involved in. 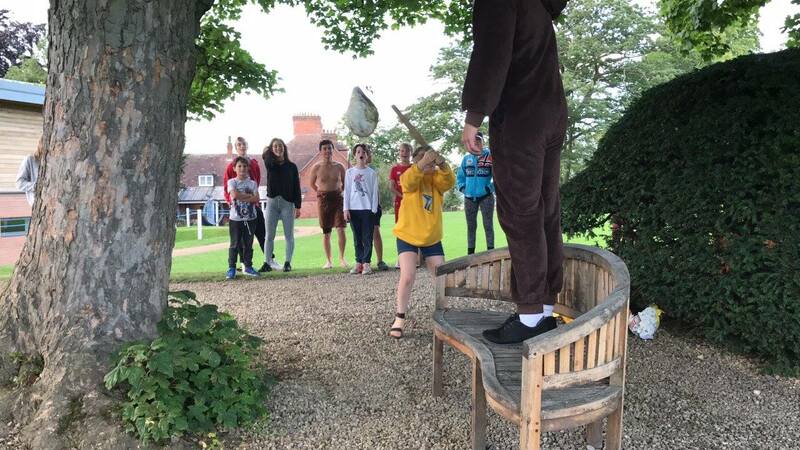 After getting in character, which included fancy dress, the kids acted out the scene and enjoyed the process of working out who the murder was. 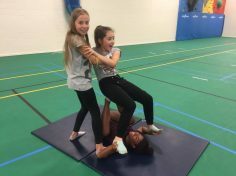 The other children enjoyed a morning of mixed sports in the sportshall which allowed them the chance to try out any games they hadn’t in the week before. 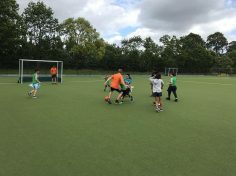 We played bench ball, handball and ultimate frisby, all games that focus on teamwork which everyone enjoyed getting involved in. By lunchtime everyone was ready to enjoy their meal and refuel for the afternoon session. Some campers again went off rock climbing in much friendly weather conditions and had a great time scaling the Yorkshire cliffs as well as abseiling down them. 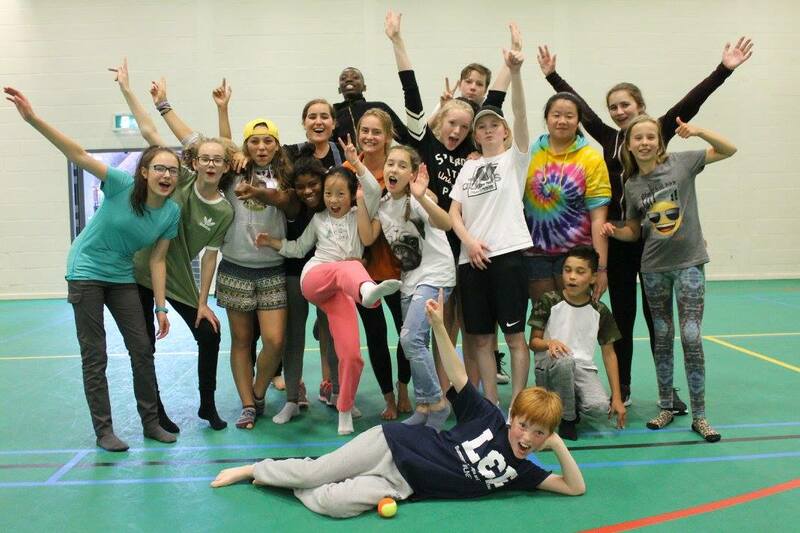 The kids who stayed on camp played badminton and also enjoyed some gymnastics and aerobics sessions. Elsewhere kids were given free reign in the art room to work on some of their previous work as well as working on new paintings, drawings and designing their own bags. 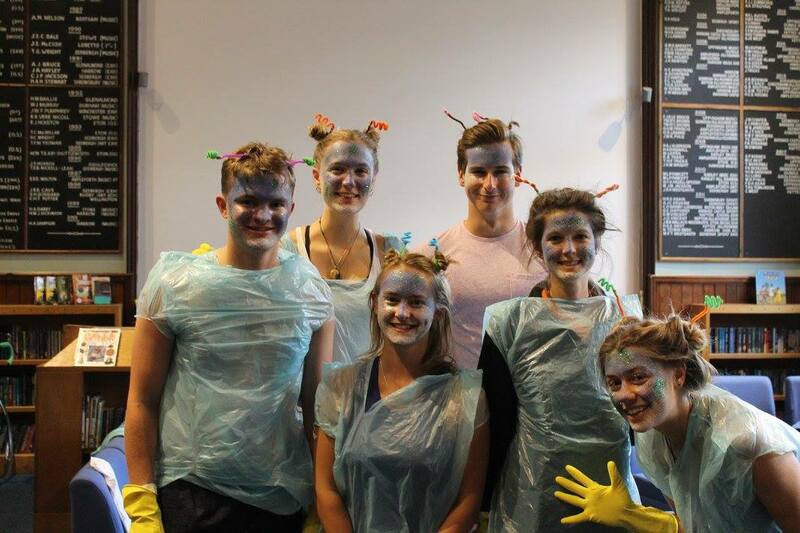 After an afternoon swim everyone came in for dinner and then got ready for this evening theme night. The theme was world leaders and the kids were given the interesting plot of an Alien invasion. 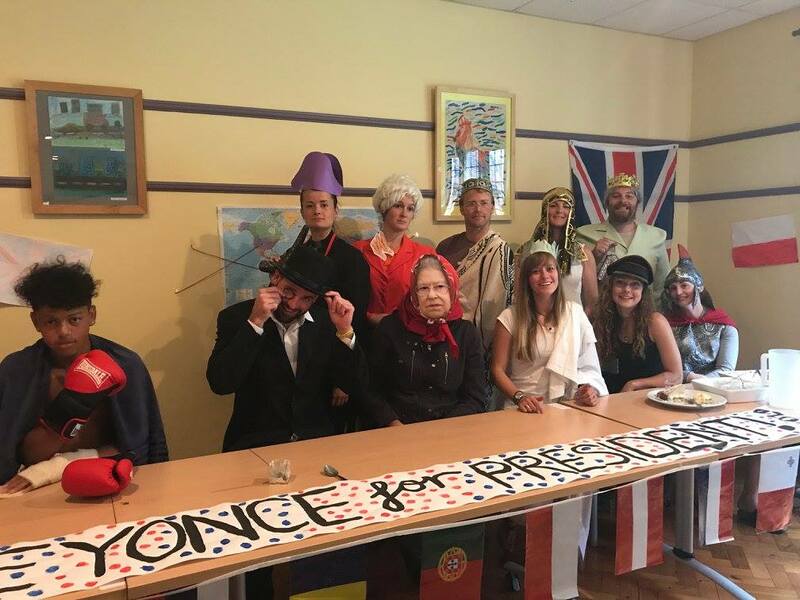 With some great outfits from both children and staff getting everyone in the mood, we headed to the school theatre for a world peace conference, however something was not quite right as the leaders of the conference such as Vladimir Putin, Donald Trump and Theresa May, played by out staff, were slowly being taken hostage. The kids soon figured out that Aliens had abducted the leaders and were planning to attack earth. 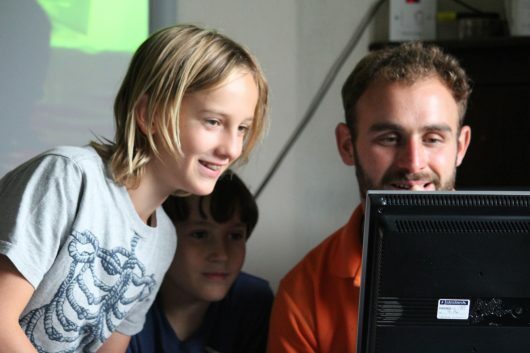 In order to save the day the kids were split into groups and partook in several activities and challenges through which they were given a code that defeated the aliens. It was a great evening with lots of laughter and fun. The kids succeeded in their tasks and the aliens were defeated. By the time theme night was over and the kids had had some hot chocolate we all got into pyjamas and headed to bed. It was another great day at camp and we look forward to tomorrow, our last day; lets make the most of it! The final day fell upon L&E, and for the first time this week, the sun shone down upon us all day long. The camp obviously takoook full advantage of this. Breakfast was served then the camp moved on over to dodgeball, where as usual the competition was fierce, skills that had never been seen before were brought out for the final day, trick plays, fake throws, ladies and gentlemen your children had it all. After the dodgeballs had stopped bouncing the children awaited their morning activities. 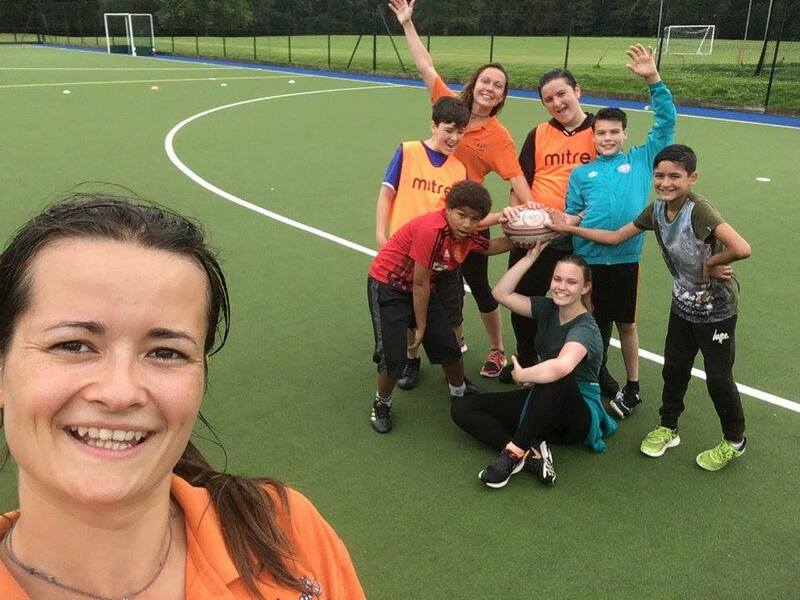 The sports option was touch rugby, where the children learned the fundamentals to play one of the greatest games on earth, a special mention going out to the warrior that is Lauren who played through a shaky ankle showing true bravery. The creative option was the long awaited science experiment morning. Attracting most of the caldrons attention, the creative activity was a hit, displaying amazing feats of science and chemistry. The adventure option was campfire cooking, (so when your sons or daughters get home ask them to cook you some “fire bread”). 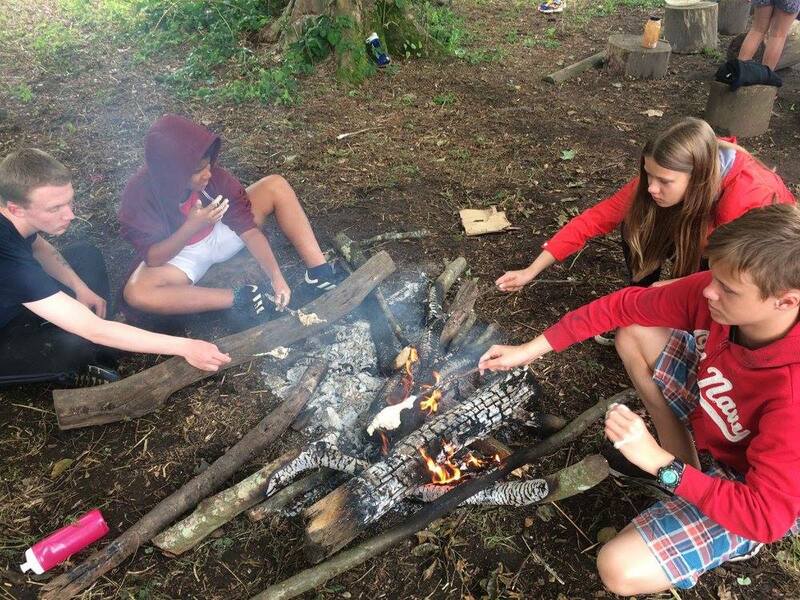 The campfire cooking is always a massive success at L&E and today was no different. 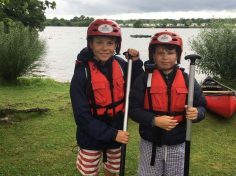 In the afternoon was the famous L&E Triathlon, where the children competed in a gruelling 3, 5 or 7 lap swim of the pool, an impassable obstacle course and then a run to finish. 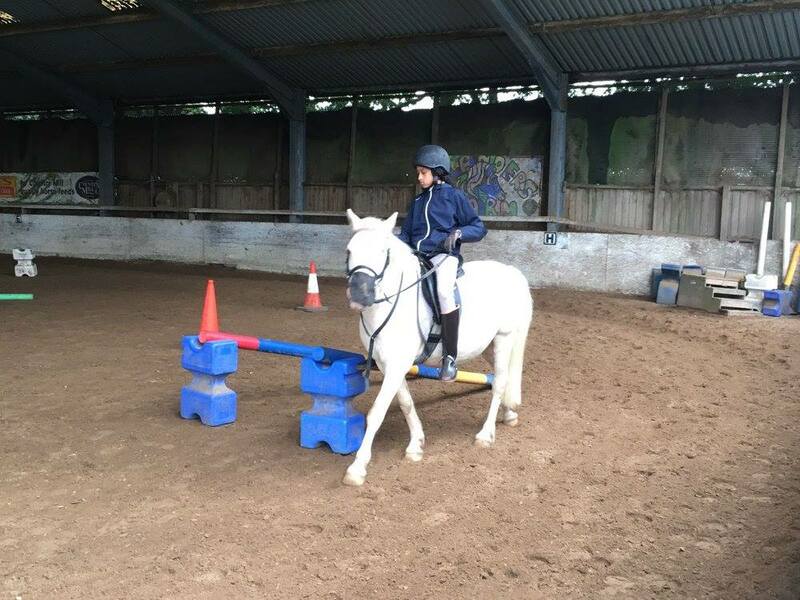 The competitors showed great dedication to the events with Alice and Andrea changing from the 3 length event to the 7 length event because they wanted to challenge themselves. 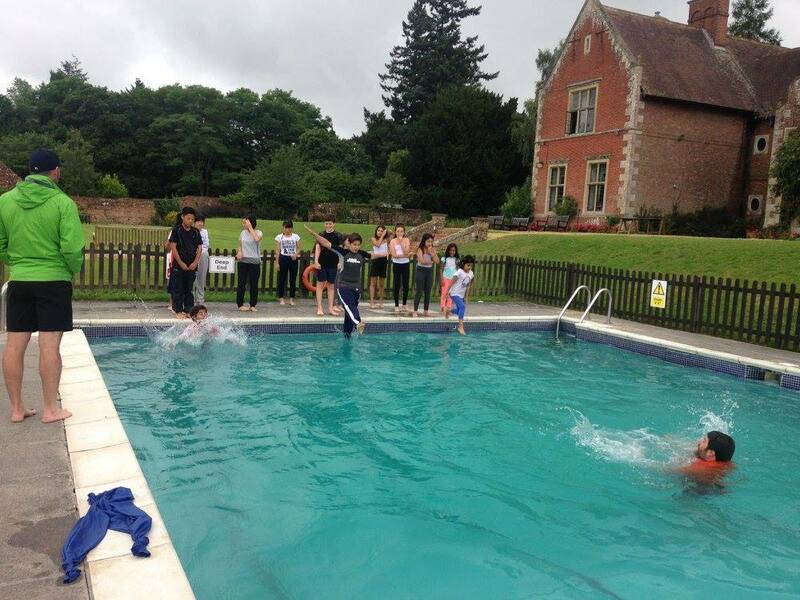 After completing the triathlon and catching their breath the children then moved over to the water slide. 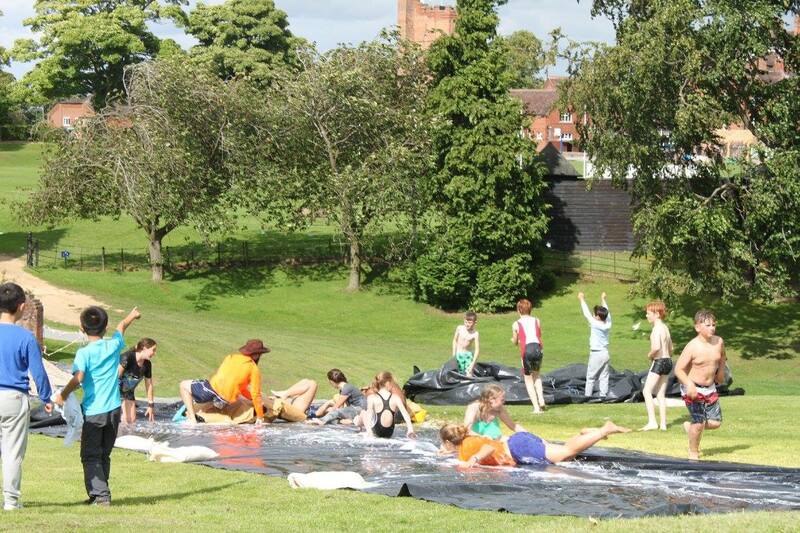 A massive sheet of tarpaulin coated in soap and water sounds like the best final afternoon anyone could ask for. 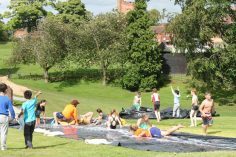 When the tutors said that it was time to get showered and clean after the slide the children had a rebellion and through sheer will power they kept the slide running. 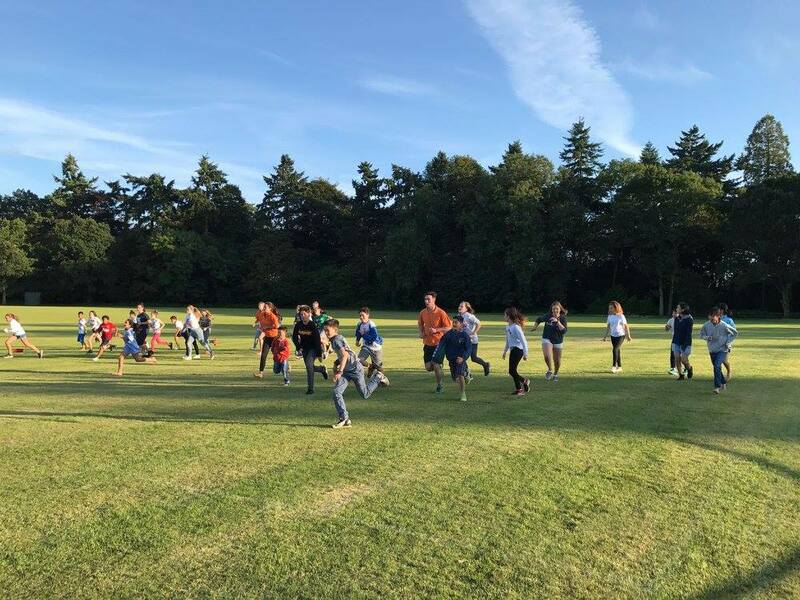 After dinner the campers were treated to a surprise ice cream van……the chimes played to the children’s surprise and they all ran out to get a cone! It was then soon time to get dressed up and head the performing arts centre for the Oscars Ceremony. Many performances were shown at the ceremony, Sam, Joe and Holly put on an amazing show with the diablo, Anna and Johanna sang and danced to the famous song ‘Eye of the Tiger’, sending shivers down the spine of the audience members, Kai and Michael would have done Penn and Teller proud with their amazing magic tricks, with an incredible disappearing act performed right before the audience’s eyes, the pair completed their show. Faye performed a song form the movie Moana which touched the soul of everyone who had seen the movie. The gymnastics fans were pleased that our very own camp tutor Will Smith (not to be confused with the super famous actor) and Alice performed a gymnastics routine, the routine had a comedy aspect which was played by Alice pretending that she couldn’t do gymnastics, her poor form made the crowd giggle and Will’s best efforts made the crowd cheer, the perfect mix! 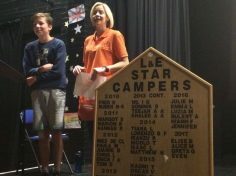 A special mention goes out to Sven who won the Star camper award for this week. The tutors couldn’t think of a more deserving winner of the award and were proud to give it to Sven. 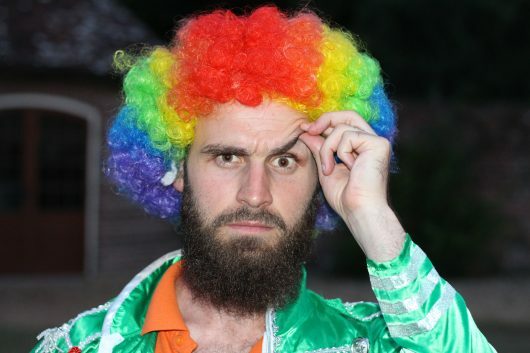 He has been influential not he sports field, dodgeball court and creative sessions and has displayed all the characteristics of a star camper. Once the oscars disco died down and the children got dressed into their pyjamas, the drank a warm cup of hot chocolate and move towards their bedrooms. Their tutors have their reflections on the week that has passed and look forward the following year. 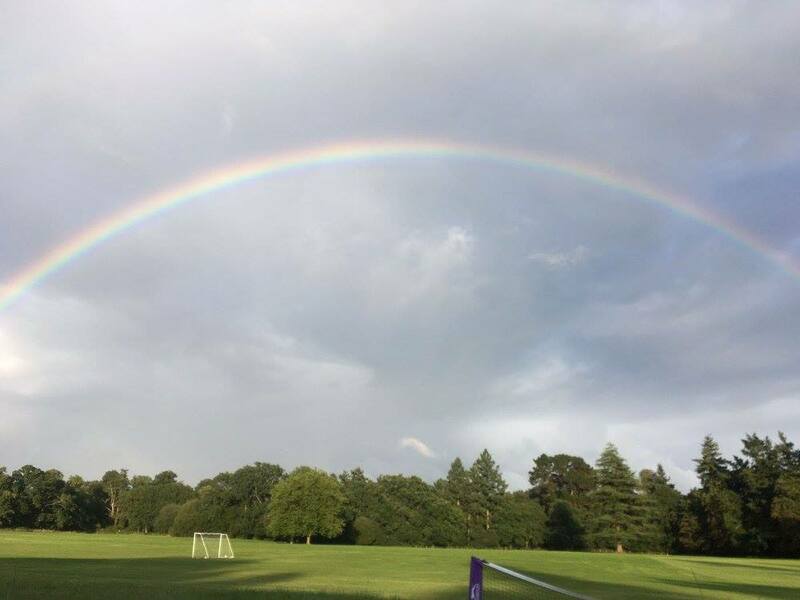 We look forward to seeing all your fantastic children this following year! 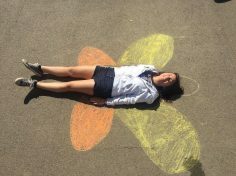 But the summer we’ve had, we’ll forever remember. 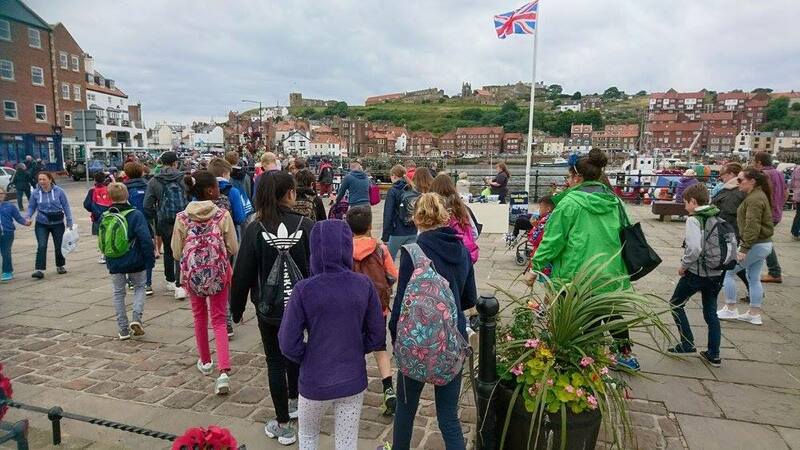 It wasn’t promising weather for this weekend’s campers, whose planned trip to Whitby looked ominous. 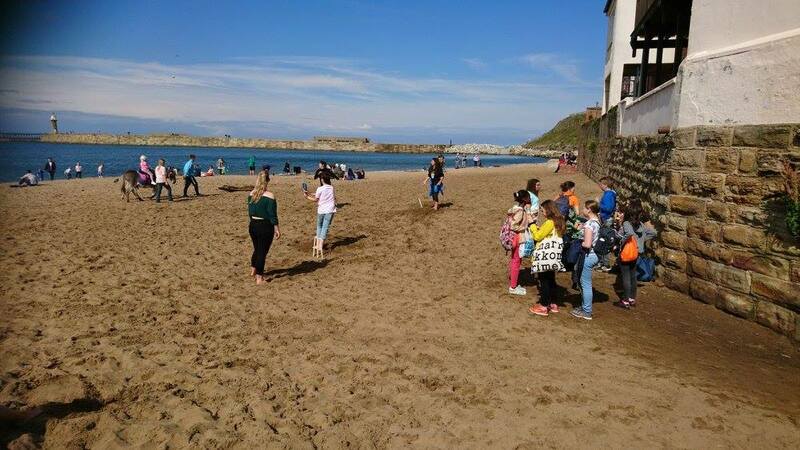 But as the camp tutors predicted the sun did grace us at sunny Whitby! 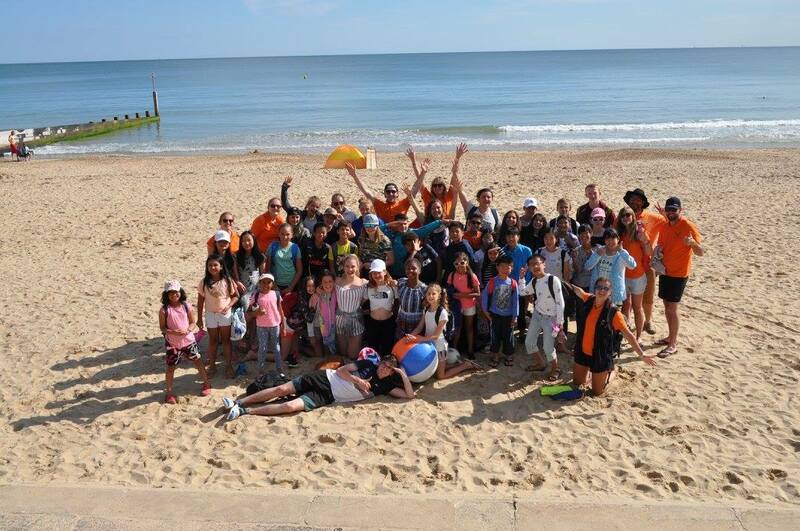 It was a wonderful day full of seaside sweet shops, beach cricket and of course a trip to Poundland! 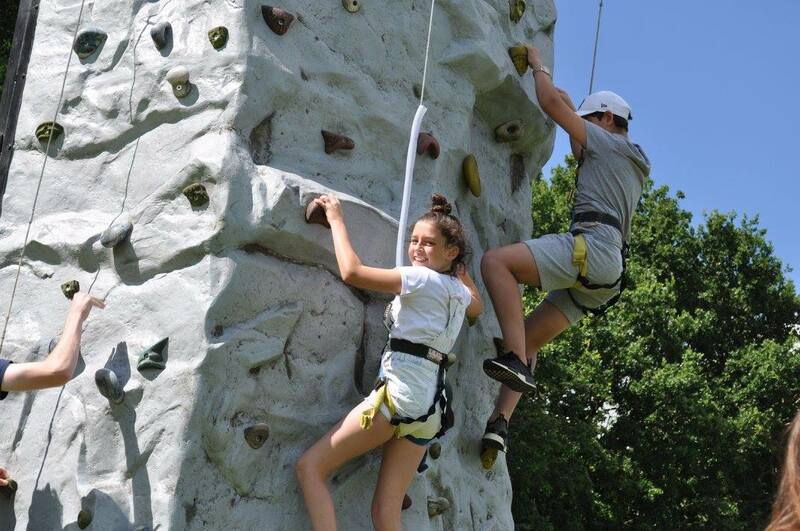 On Sunday, there were several tearful campers and tutors as we said goodbye to last week’s campers. Not long after that the excitement kicked in for our new arrivals. Many of the ‘old hands’ were there to welcome the lovely, bright new faces. New friends were made within minutes and games of pool and ping pong were created as the rain confined us to the main house. Our lovely planned BBQ was relocated indoors and the children enjoyed the burgers and chicken that was on offer. With parents being bid farewell, it was time for the games to begin. With a quick dash through the downpour to the sports hall, many a game of fruit basket, stuck in the mud and bulrush commenced. The children had a great time getting to know each other and with hot chocolate in their bellies, new friends made it was time for bed. As the whispers quieten down the excitement builds for L&E North camp week 3. Campers woke up this morning under a grey sky but very keen on enjoying their first day of the week. After having eaten a delicious breakfast, they took the road leading to the sports center for our first session of morning dodgeball. Whilst being very competitive, every one got to throw the ball around and try out new strategies based on the Roman army, using gymnastic mats as shields to counter the balls. This early warm-up ended on a crushing victory of the kids over tutors, who were wildly outnumbered. Campers then went into their different morning groups. Creative did stop-motion and a bunch of new ideas were found very popular throughout the group. The English class went on a treasure hunt and very much enjoyed learning new words, in the most comical way. 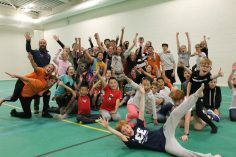 In sport, plenty of energy was spent in the sports hall during an incredible indoor football session. The brand new French class was launched today in L&E with 5 children eager to learn a new language. The session was highly engaging and all had a great time. 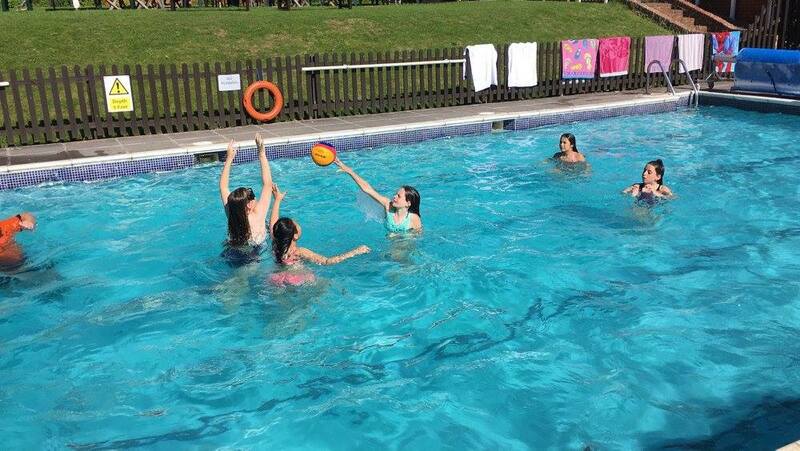 In the afternoon, the sporty amongst us tried their talents at a session of waterpolo. An intense, but fun effort, as always in sports here at L&E. 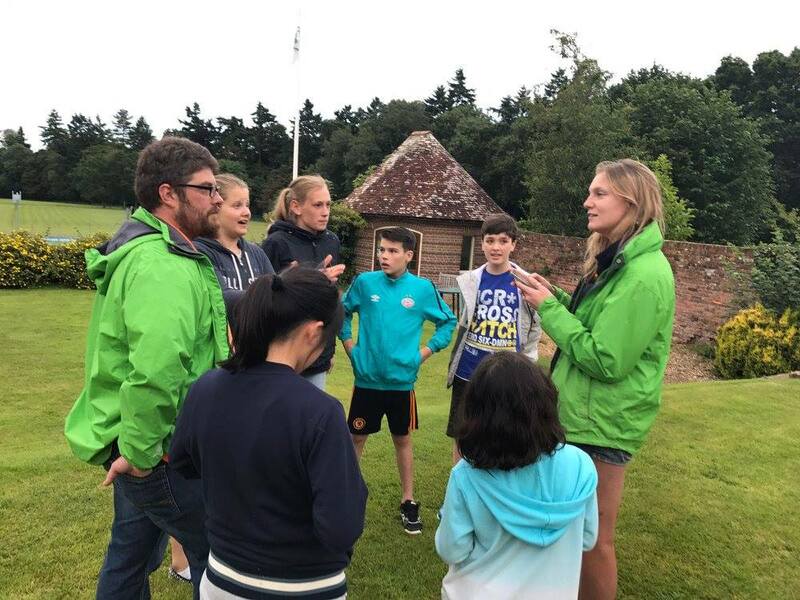 In adventure, another exciting treasure hunt was proposed to kids during the 1st half and a nice walk offsite to finish the session evolved. The creative group started a music video with another great set of costumes for the children. The children when from set to set and had fun creating new scenes. Dinner was a feast of fish, sausage and salad which was devoured by tutors and campers. It was then time for…”icebreakers” one of the most important nights of L&E. All teams gave their best in the different tasks that they had to do. 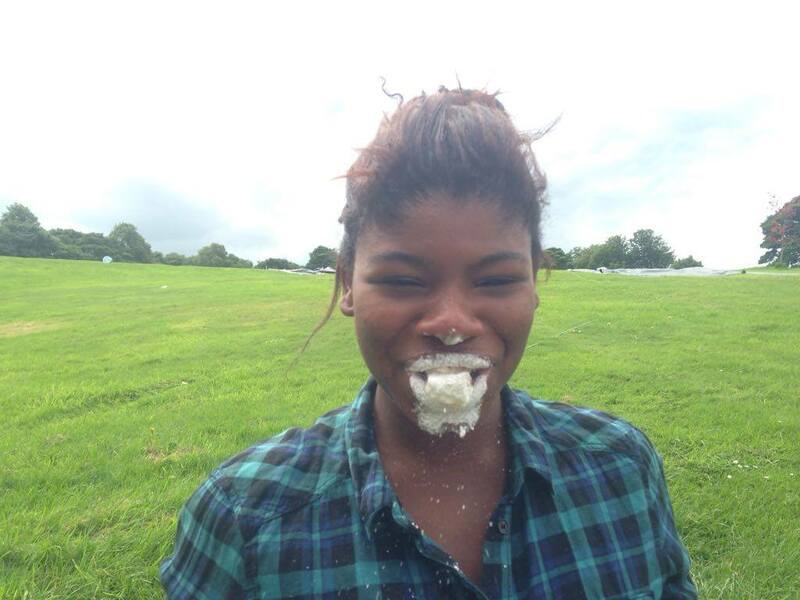 Several sprints and egg throwing events were on the menu and hot chocolate was offered as a reward. 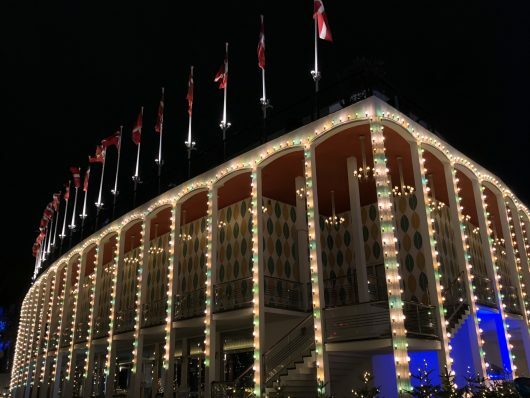 Everyone went to bed, having had a great evening and looking forward to the new day at L&E! After beginning the day with a sumptuous breakfast of scrambled eggs on toast, the campers of L&E prepared for the day ahead with the age old morning activity of dodgeball. 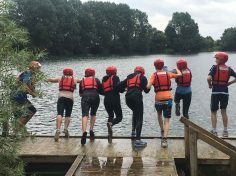 They ducked, dived, dipped and dodged their way to success, and moved on to a variety of morning activities. The adventure options today consisted of the all day adventure scuba diving experience, which proved extremely popular amongst campers, as well as extreme fire preparation for tonight’s campfire, and also provided the opportunity to cook a few morning treats. Vegetable based painting was the creative inspiration of the day, making pictures using onions, peppers and also potatoes. 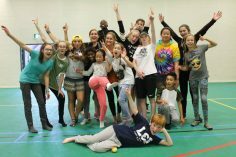 The sporting endeavour this morning was indoor kickball, progressing from the previous dodgeball session to an energy fuelled competitive session were fun was had by all. 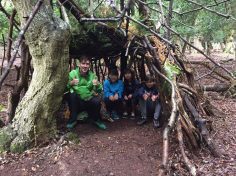 I’m English the students went on a bear hunt, surveying the school grounds to find an elusive bear, whilst experiencing the versatile facilities aysgarth has to offer. Finally our French students studied and sampled the many aspects of a traditional French breakfast, working on their language skills all the while. Following a cracker of a curry at lunchtime, the ever reliable British weather decided to give us a glorious afternoon, and henceforth an afternoon of outdoor themed activities commenced. 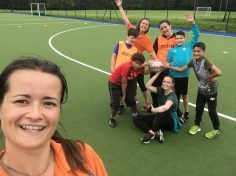 The sport option was a return of the immensely popular touch rugby, where a small tournament engaged between students inclusive of all, no matter of age and rugby playing experience. The creative bunch excelled in tie dying socks, each turning a simple white pair into a psychedelic fashion statement that wouldn’t be out of place on any parisian runway. Due to the fortunate turn in weather, campers got another go on last week’s favourite, the waterslide, slipping and sliding their way to the bottom of our slope in a fun filled hour. The daily swim was next, followed by a pizza, wedges and vegetables, with all left in the day now being the highly anticipated campfire. Down by the fireside we had many group performances, with camp favourites such as ‘boo-chicka-roo’ going down particularly well. 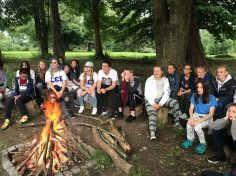 Then some excellent solo performances from the likes of Greta and Siena were followed by campfire games and a toasted marshmallow or two. The day ended with a nice hot chocolate, and then all went to bed. To continue our journey, all united. We all woke up this morning surprised how quickly the week is going. After a lovely breakfast and some dodgeball to wake everyone up, the excitement of the days events began. In English classes horror stories were written, acted out and filmed ready for being presented at the Oscars awards tomorrow, along with music videos in French lessons. In creative, final touches were made to the volcanoes created yesterdasy and they are now ready for erupting. Others used their creative skills to prepare for tonight’s theme night and we made and decorated piñatas. 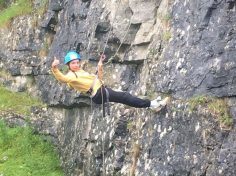 Meanwhile, others were splashing about in the pool playing volleyball and the adventurers were off monkeying about climbing rock walls. After lunch, the fun exploded as rockets were created and blown off with water to shower everyone. 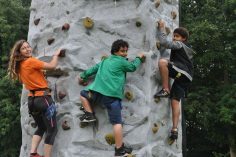 A competitive tournament of indoor benchball and handball ensued and more adventurers went rock climbing. 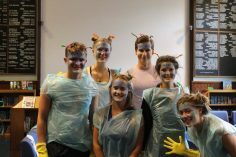 We all enjoyed a deserved dinner and finally it was time to let the wild fun of the theme night – jungle book, to commence! Costumes were put together and we all got into character of our favourite jungle animals. We embraced our musical sides with dancing, defeated piñatas, cracked riddles, painted and tested our pack abilities as wolves. In the end we succeeded in defeating sheer Khan and were able to create the firery ‘red flower’. 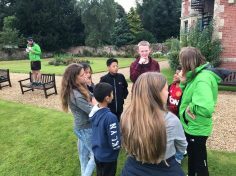 After all the excitement of the day it was time to wind down with some hot chocolate before heading to bed, where some impressive bedtime stories were told by Tashy, and everyone settled to bed, ready for tomorrow’s fun and games. 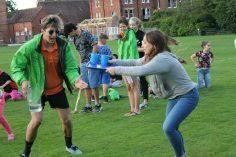 After a fantastic and enjoyable Jungle Book theme night it took the campers a little longer to be roused from their beds this morning. However, when they made it downstairs there was a yummy breakfast was waiting for them as were the tutors with smiles on their faces. 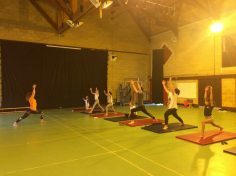 Breakfast was soon done and dusted and it was then time for what is usually the fast and furious and fiercely competitive morning dodgeball however this morning there was a twist as also on offer was the more relaxing yoga to re- centre and prepare us ready for the day ahead. As usual there were lots of different activities on offer this morning to cap off an exciting week. In French the group spent the morning rehearsing for their performance at the oscars which was epic! 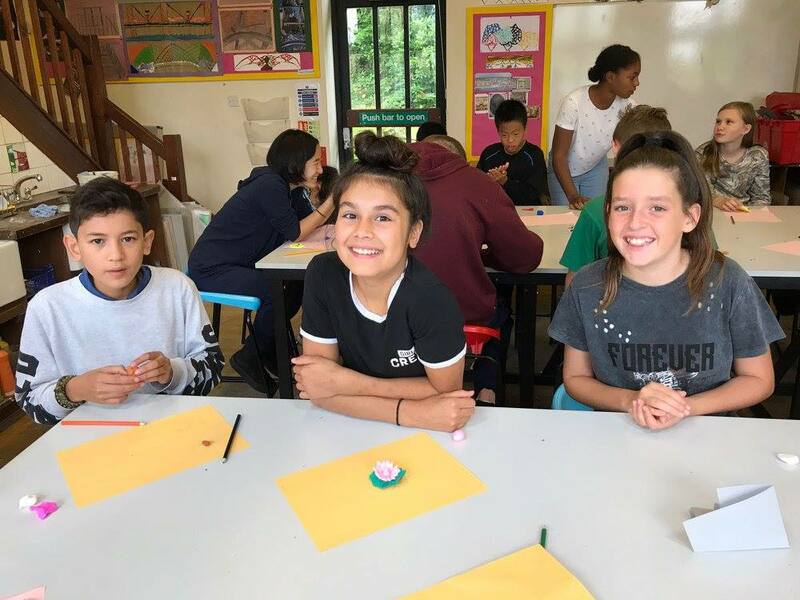 I think it is safe to say that all the girls have enjoyed learning French and have definitely improved with thanks to our resident French tutor Baptiste – it was lovely to see all of the group personally thank him at the Oscars. 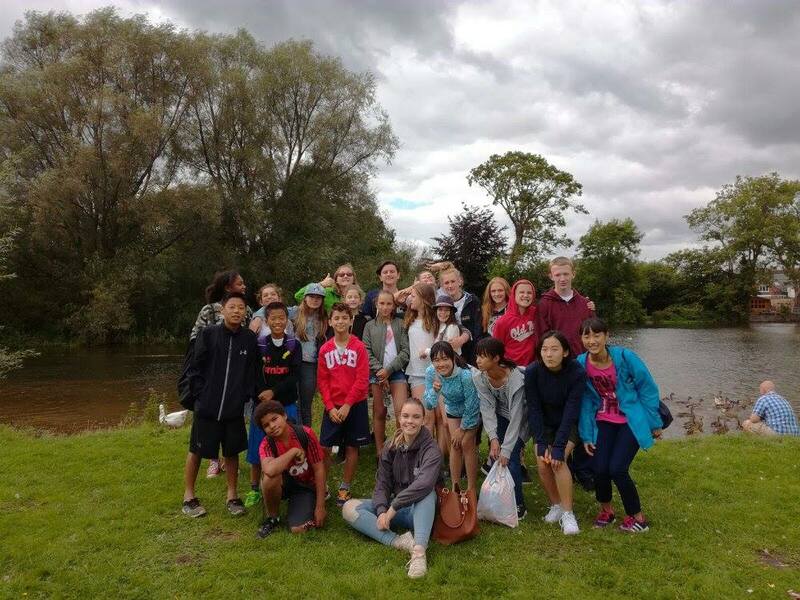 In English this morning the group ventured out in the local town of Bedale with a list of items to find. All impressed and some creative options for some of the things on the list where found. Some campers took it upon themselves when asked to find a old thing to buy a financial times and change the year on it! Most items on the list where ticked off and everyone stayed together which was the most important thing to Sam and Paul! 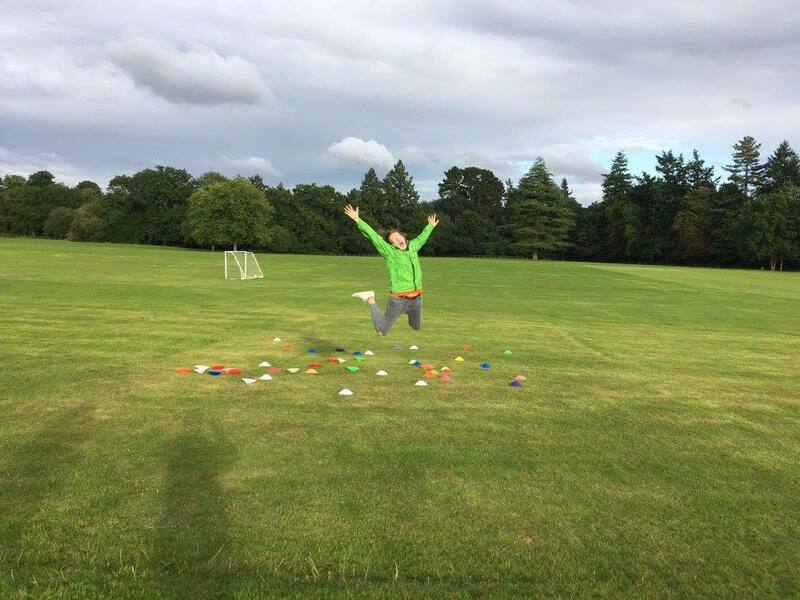 In creative they made the most of Hayley’s creative skills before she leaves us this weekend and made and launched water bottle rockets. 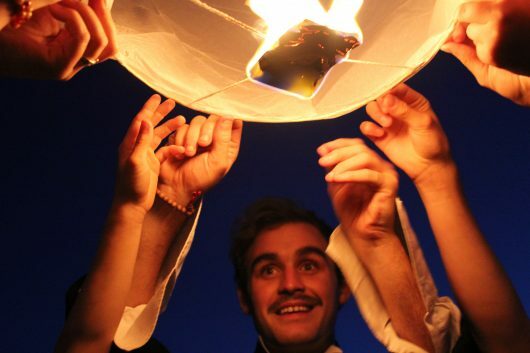 They were a great success and shot high into the sky – make sure you check the videos out! One of the other creative options was making jigsaws out of the campers favourite things. 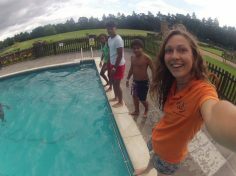 The sportsmen and women amongst the camp had a great morning playing extreme pool games – I am told a lot of splashing happened. Food was on the agenda in adventure and the campers used the skills they had learnt earlier in the week to build a fire so that they could make bread and cook apples. Apparently they were yummy! The afternoon saw the weekly L&E triathlon happening. With the shortage of any bikes the bike leg of the triathlon was changed to an obstacle course involving fancy dress and dribbling in and out of cones. The final finish was a scramble up the water slide to the line. The campers could choose to complete it in groups with one person doing each leg or individually and also the level of difficultly. 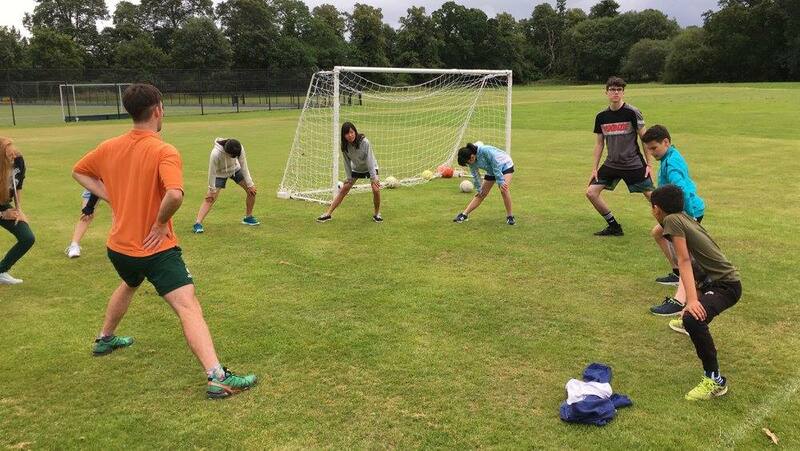 The winning team on the longest course consisted of Simon, Matthew and Sam – special mention must go to Adrien who was close to the team time and he did it on his own. Once the timers had been stopped and the winners calculated the daily swim commenced alongside with a highly competitive mini football match. Campers also took the time to do some drawing and explode the volcanos they built earlier in the week. 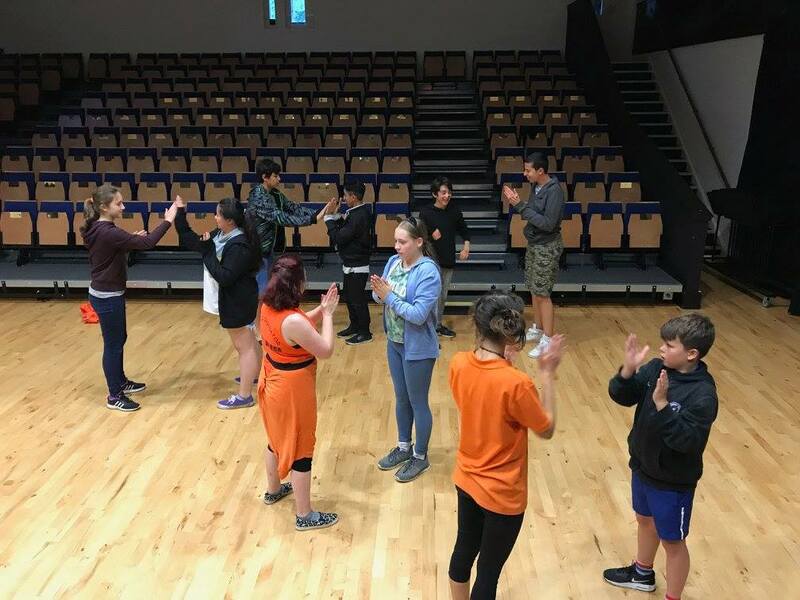 Some of the campers also took the opportunity to rehearse in preparation for their performances at the Oscars this evening. 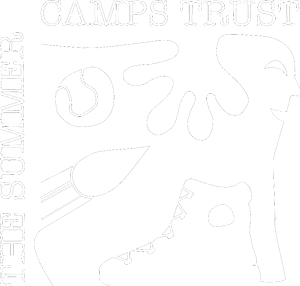 Then came the most anticipated night of camp…… the oscars. The dresses and ties were donned and that wasn’t just the tutors for an evening to celebrate what has been a highly successful week at L&E North. 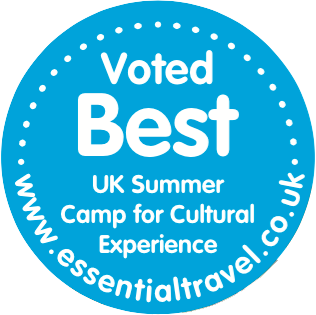 We enjoyed some fabulous performances including Sienna dancing, Fay singing, Hubert’s pub quiz , a dance from Georgi, charlotte, Maria, Sofia, a performance from the French group, a piano performance from Greta as well as all the usual videos and awards to honour all the amazing campers. 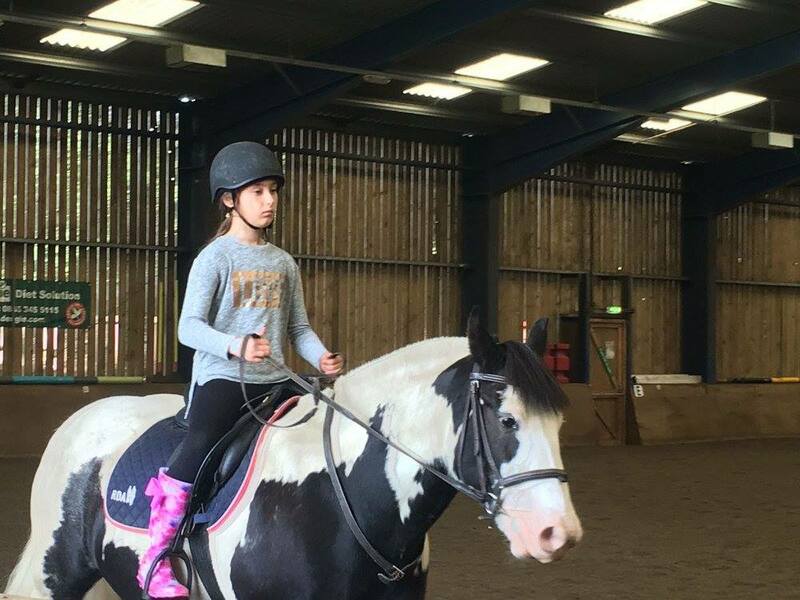 The winner of the this weeks star camper was Greta, who was a popular choice amongst the campers and staff. 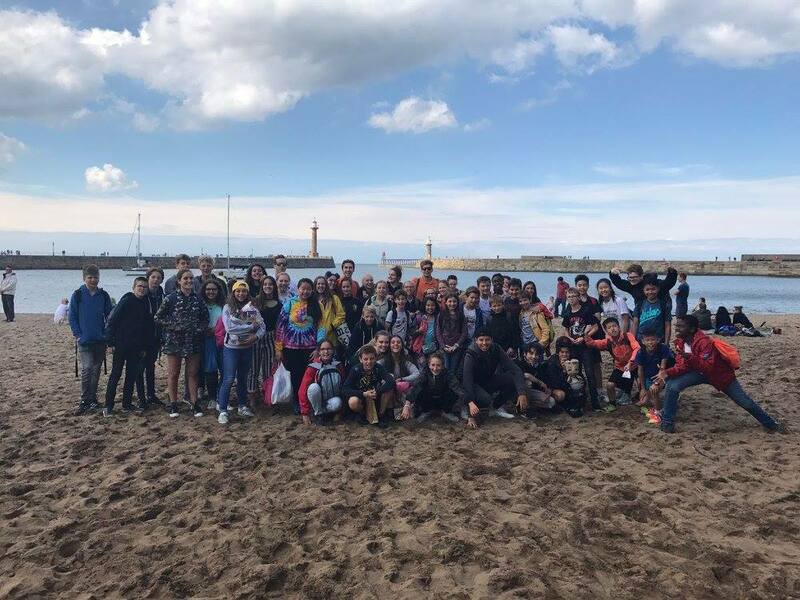 As the week draws to a close the sadness of saying goodbye to staff and campers who are leaving us this week starts but the memories of the times we have had together will last forever. L&E is such a special place and we are all lucky to be a part of it!